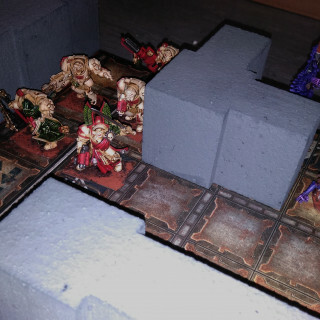 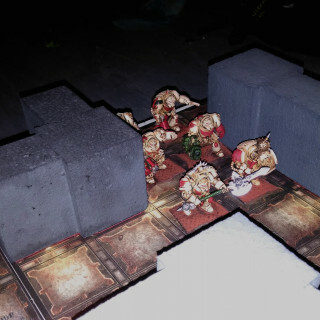 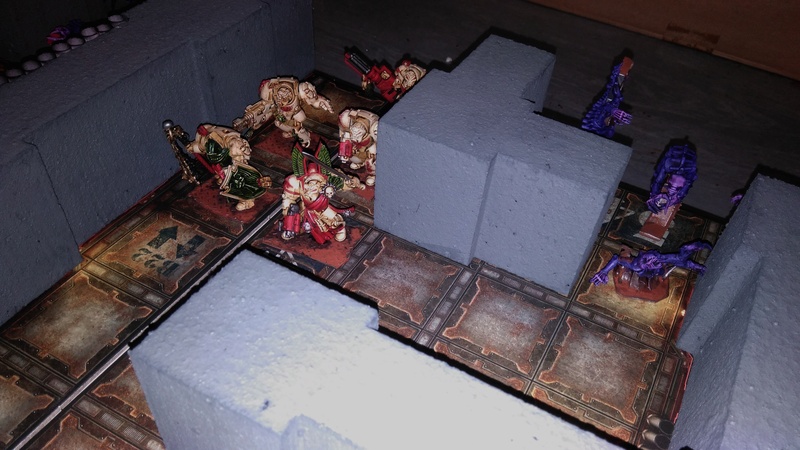 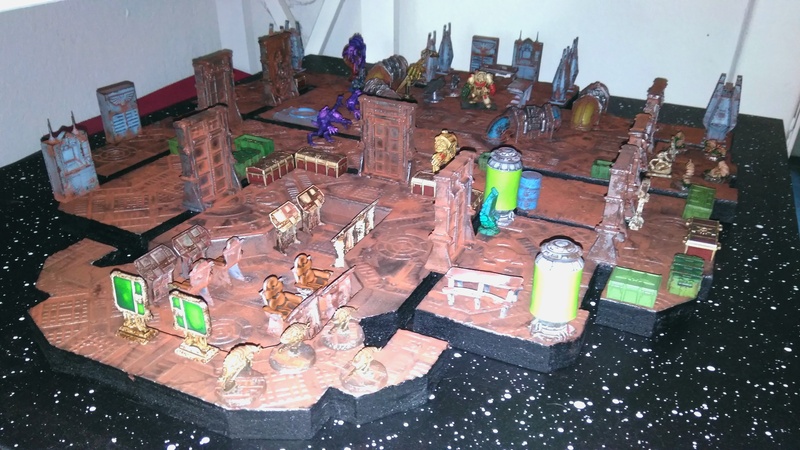 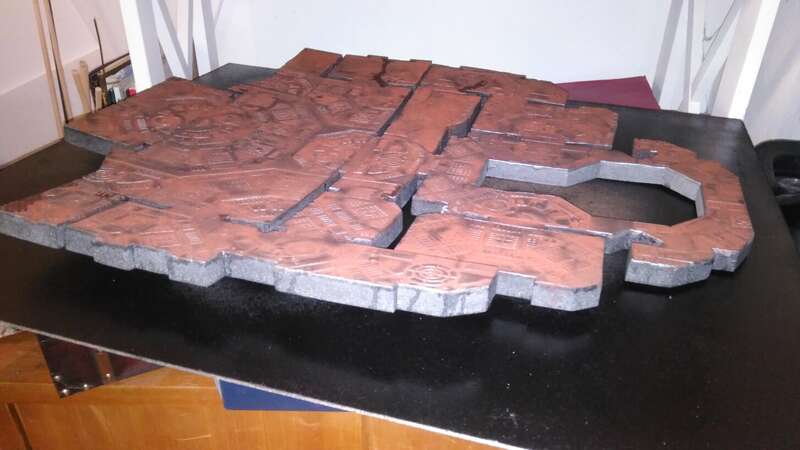 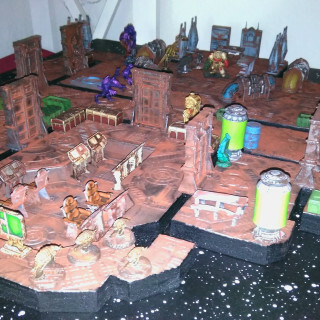 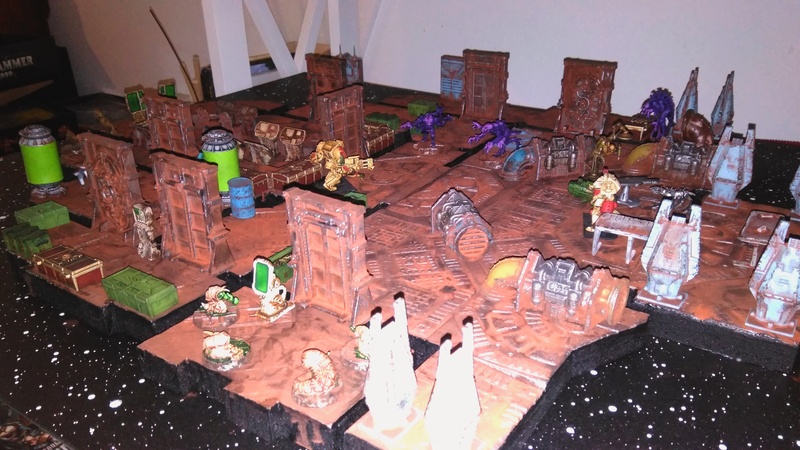 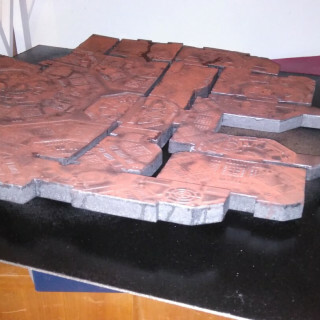 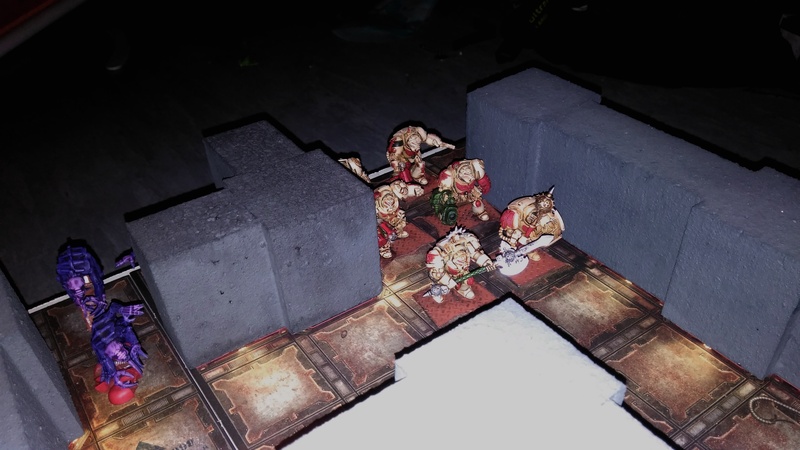 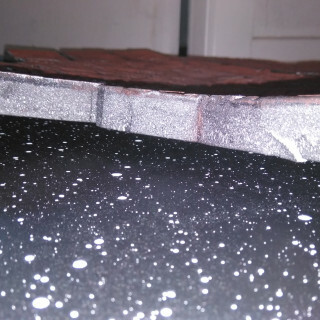 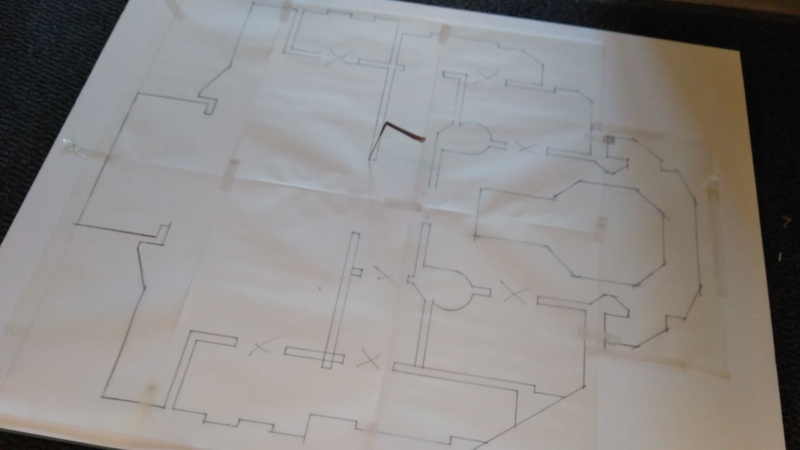 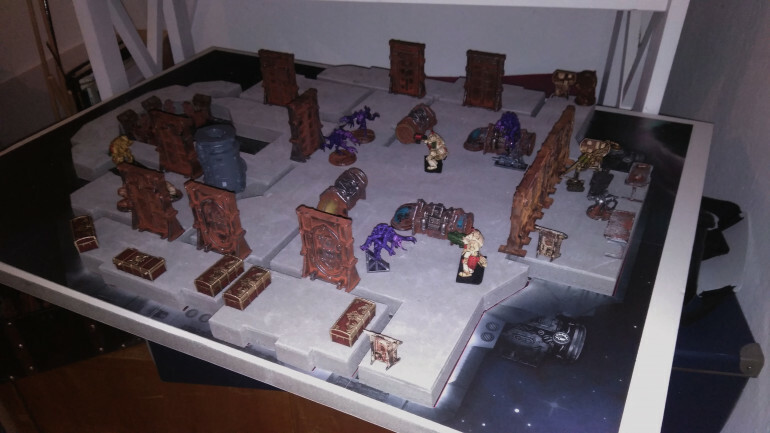 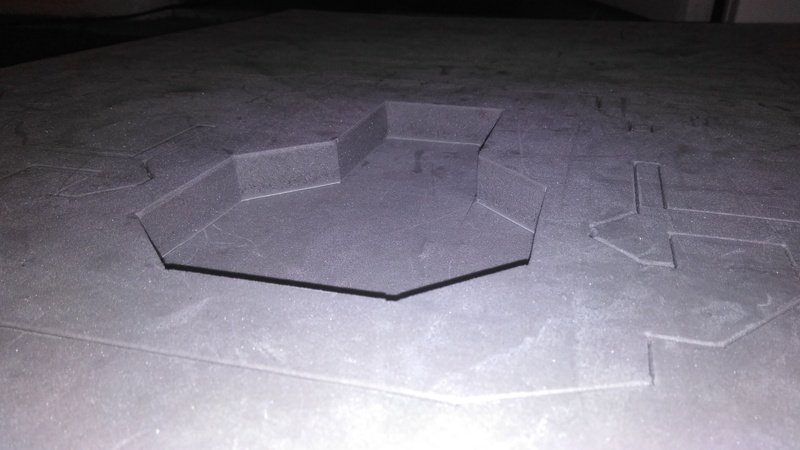 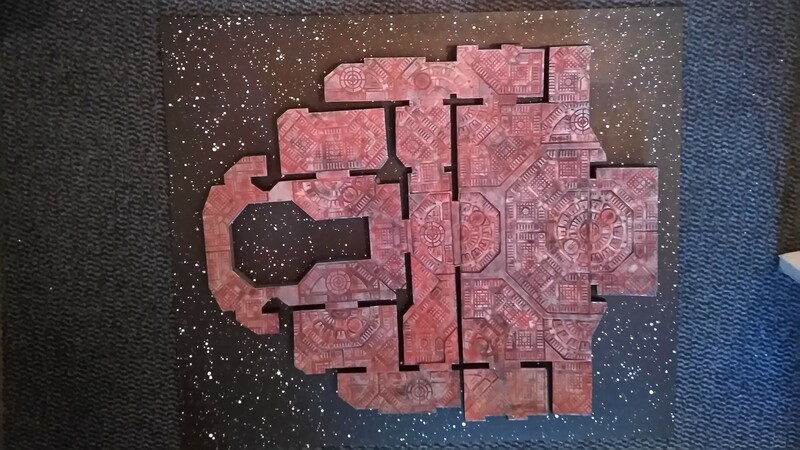 As part of the Space Hulk Challenge I decided to go with an Idea that I had since the Rogue Trader Box came out; To make a real Terrain peace out of the cardboard tile. 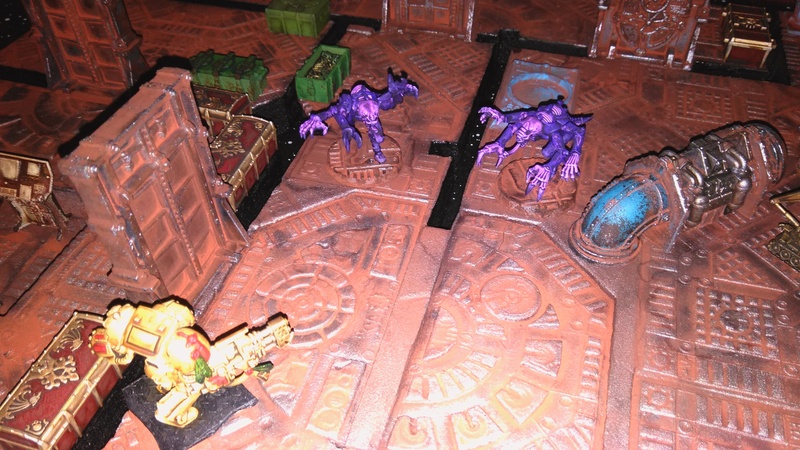 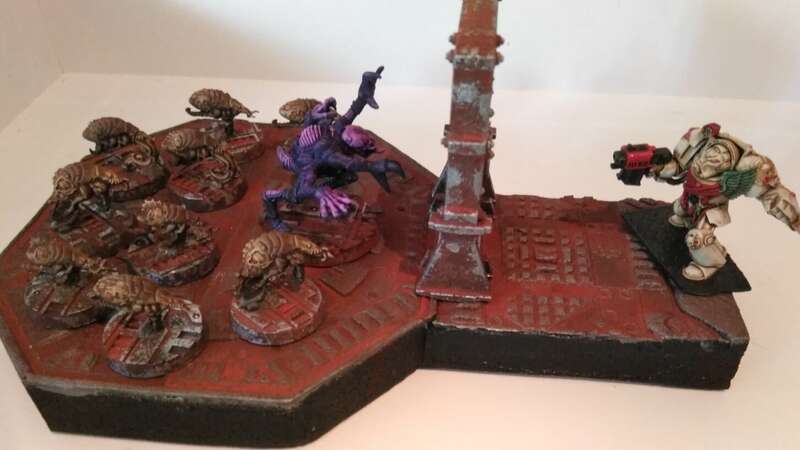 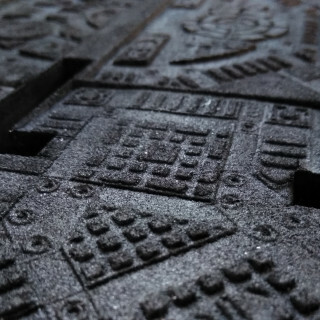 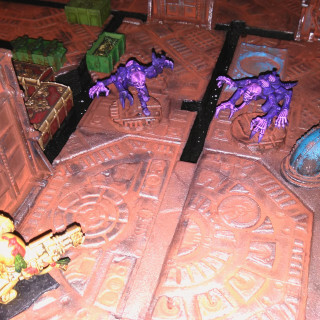 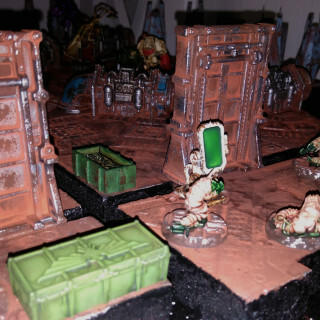 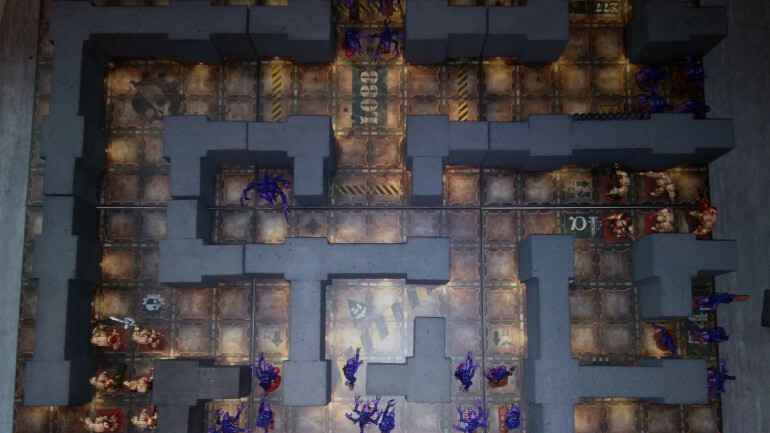 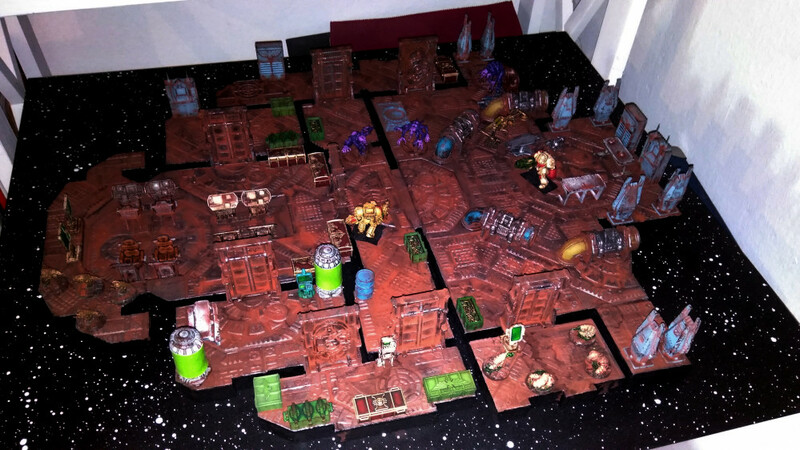 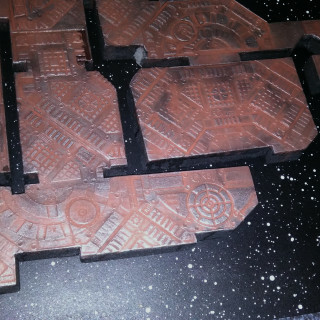 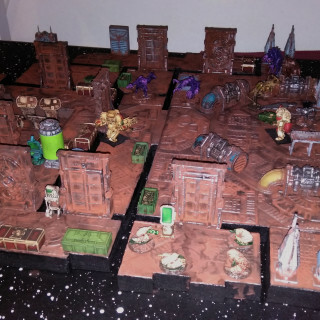 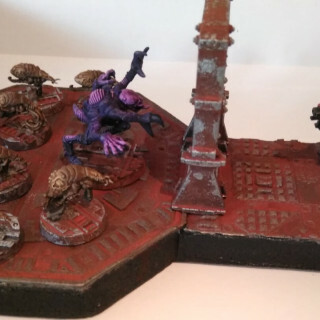 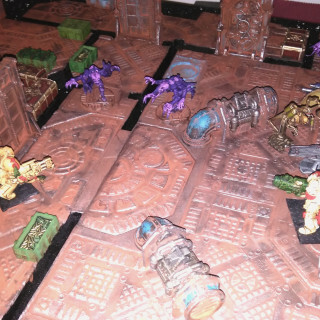 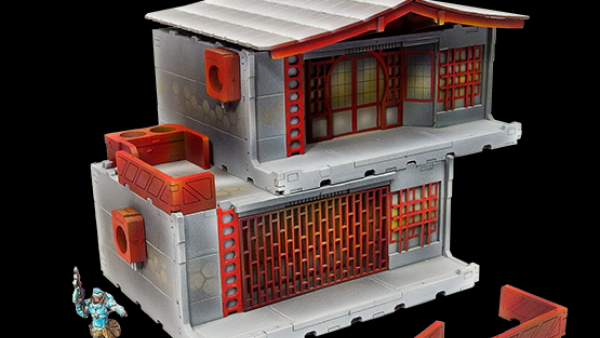 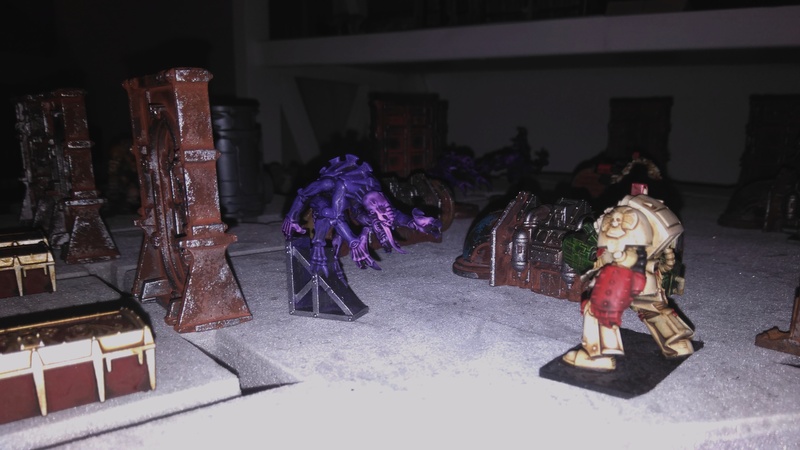 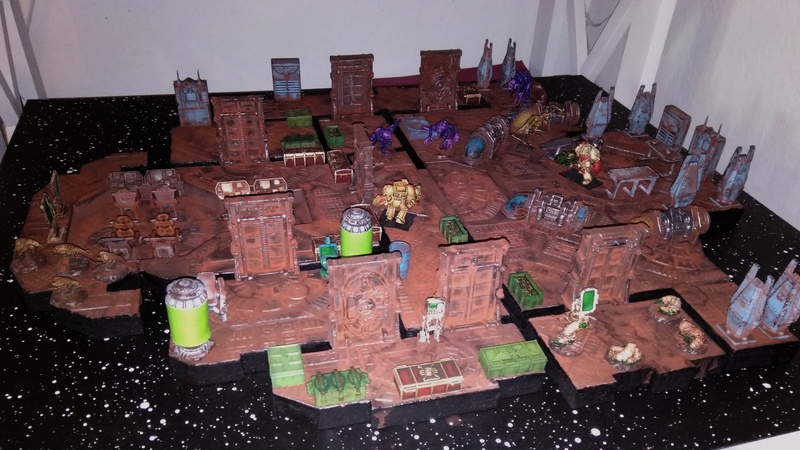 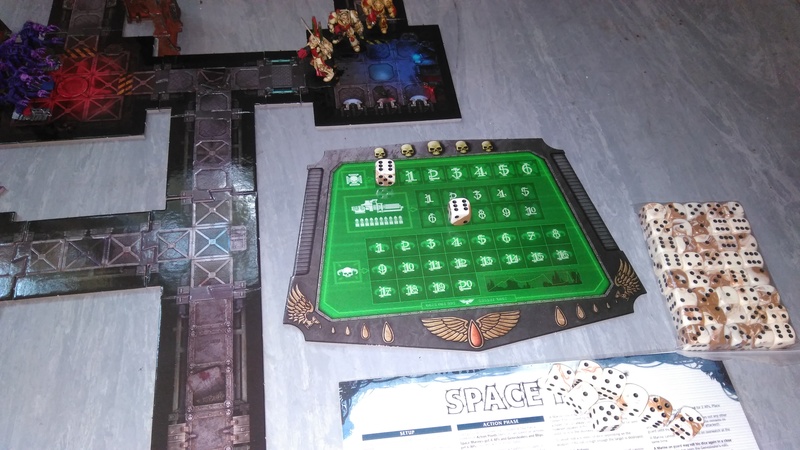 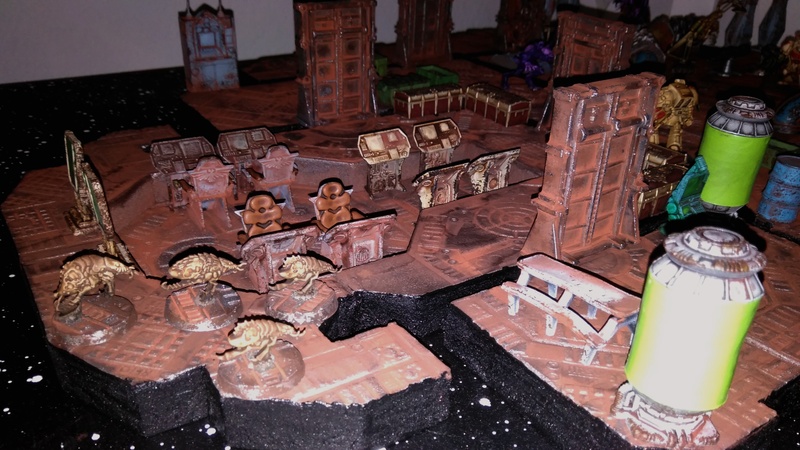 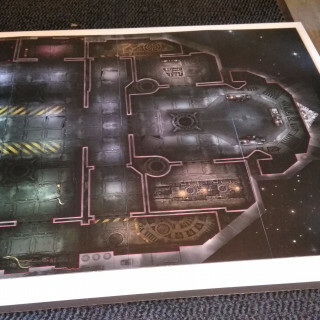 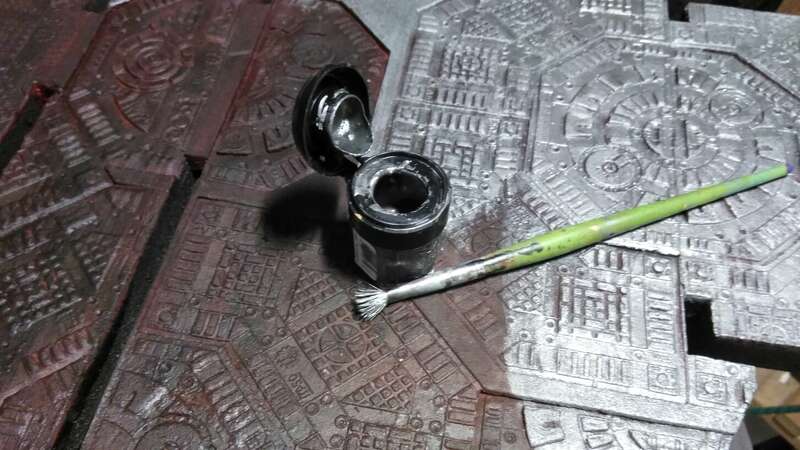 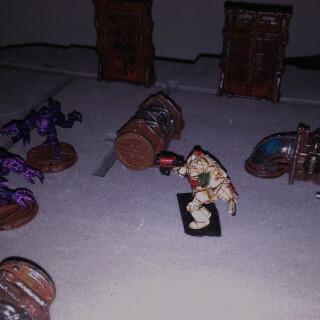 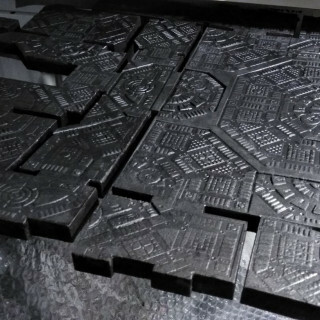 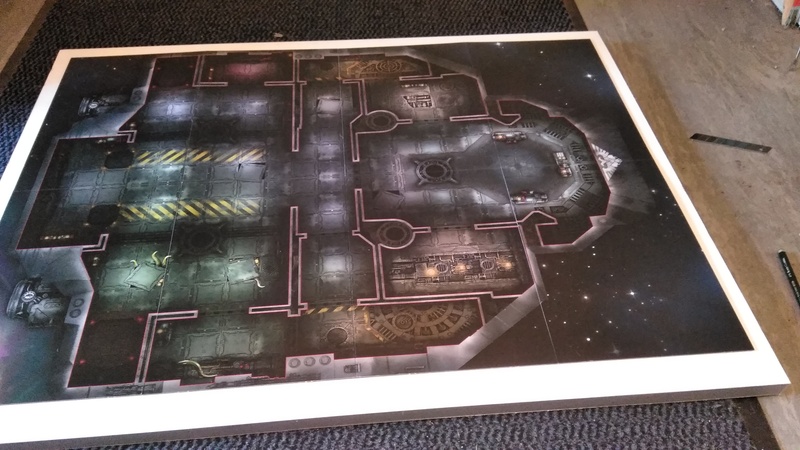 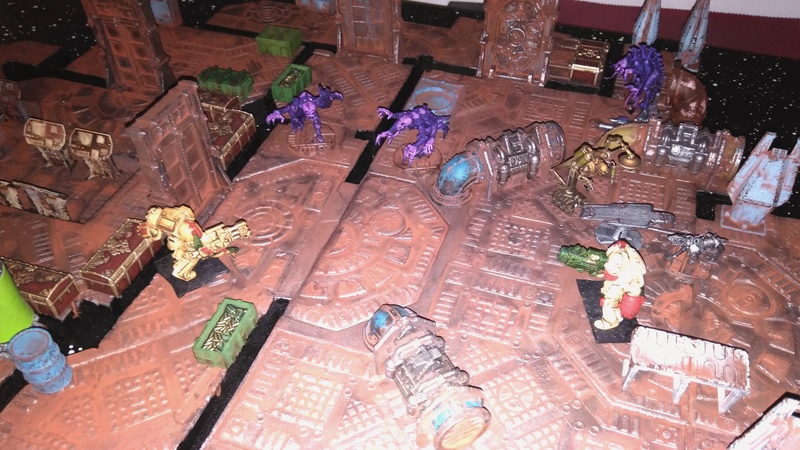 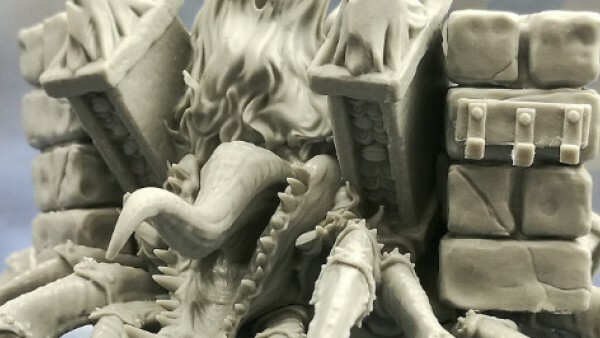 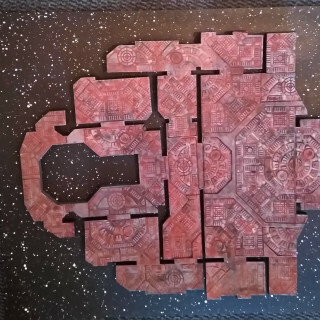 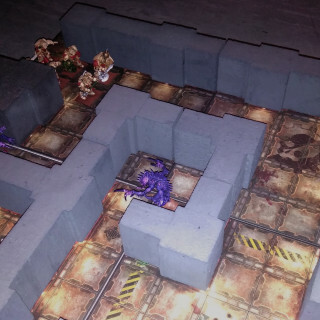 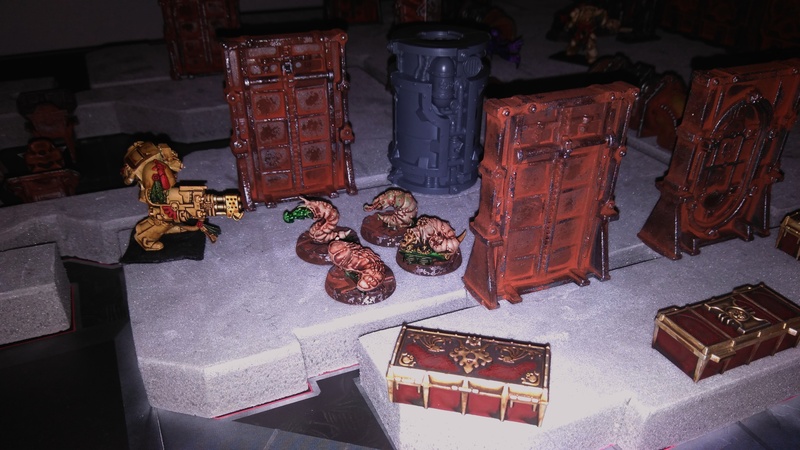 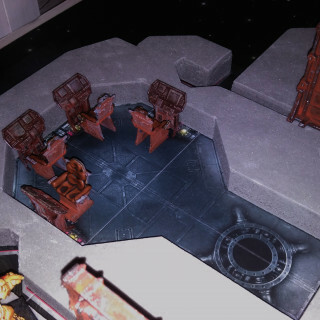 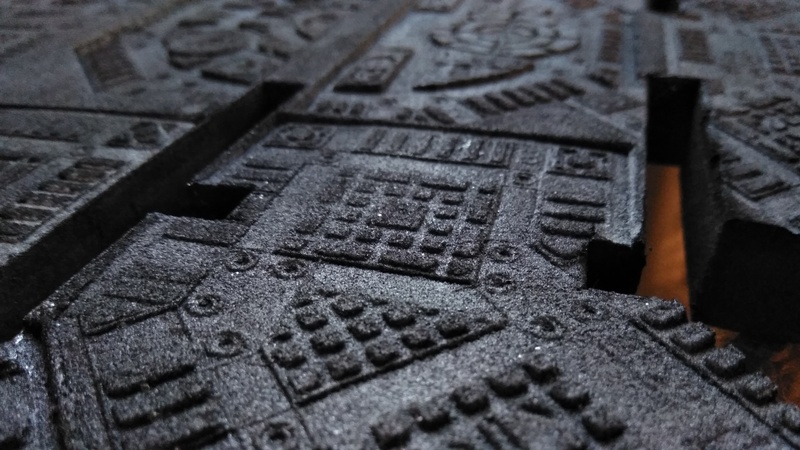 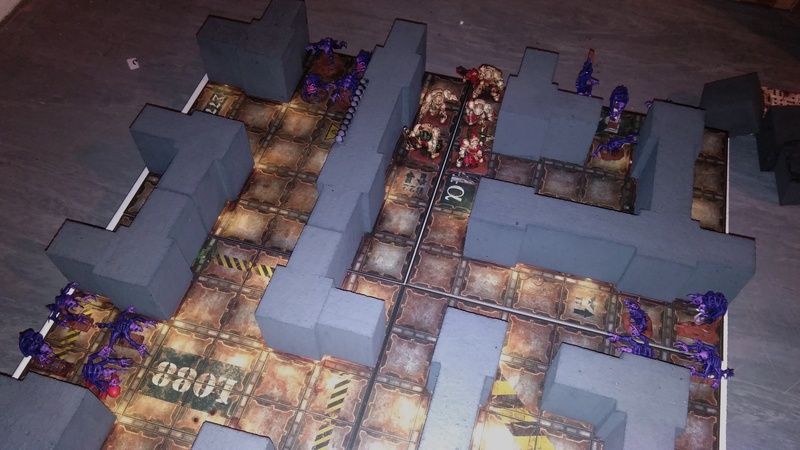 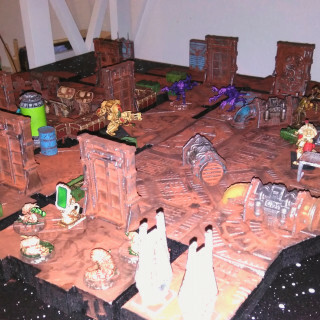 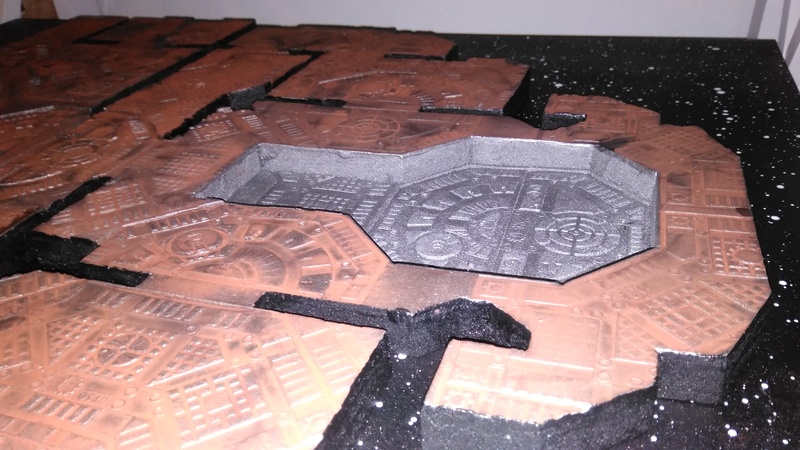 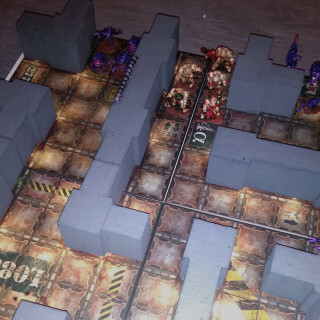 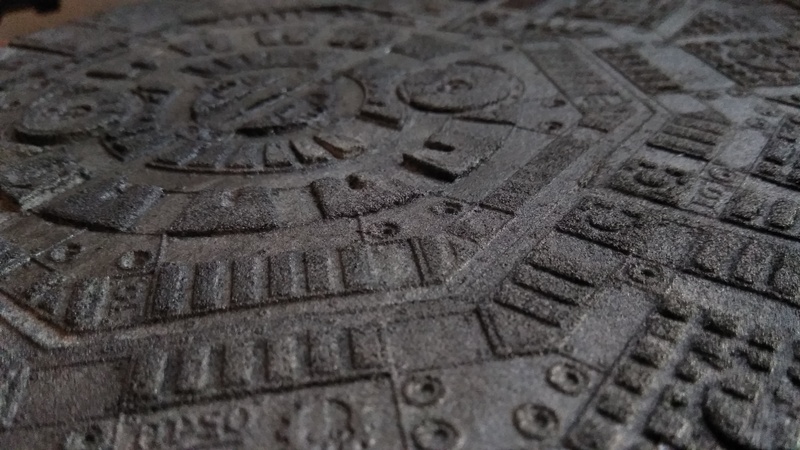 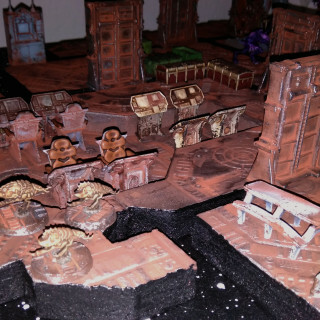 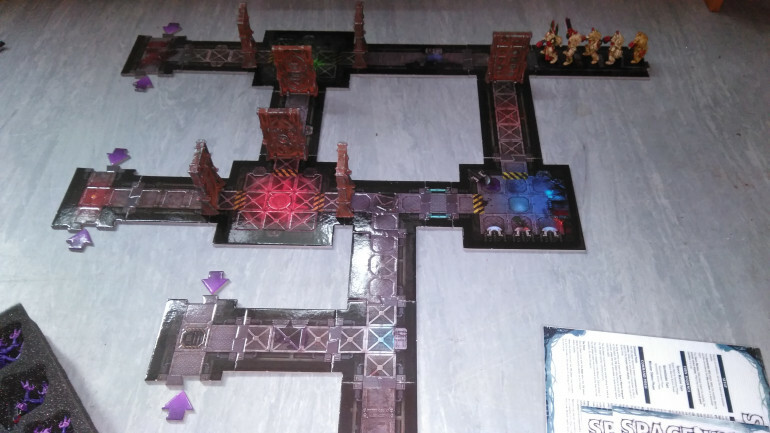 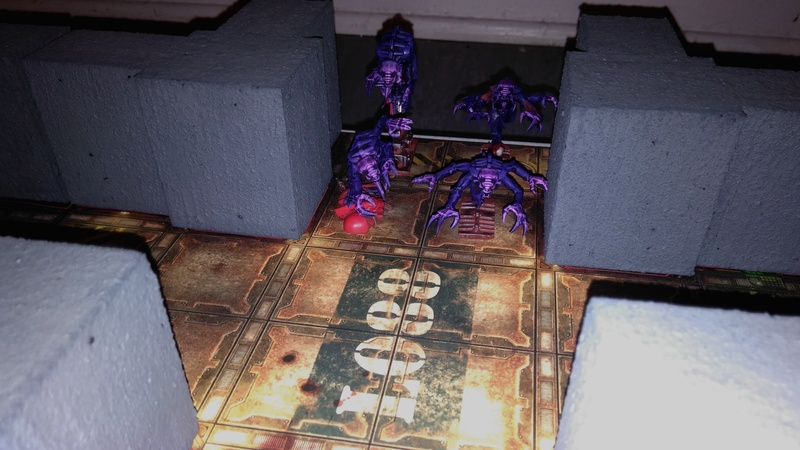 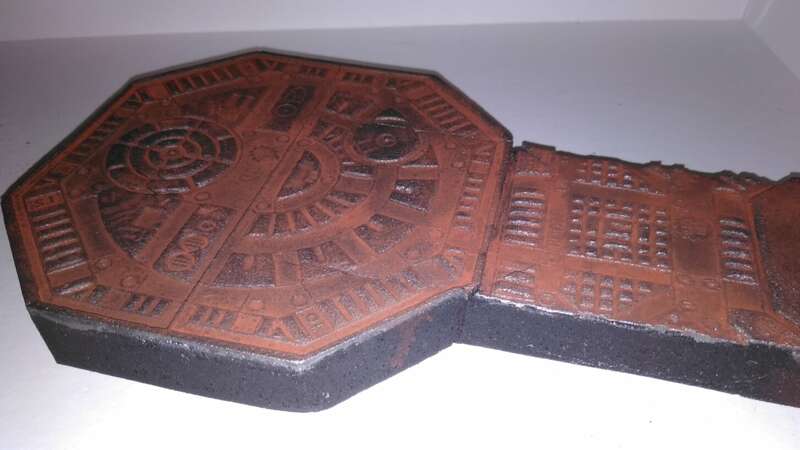 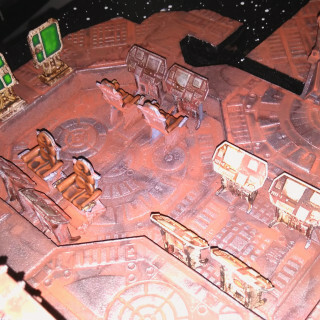 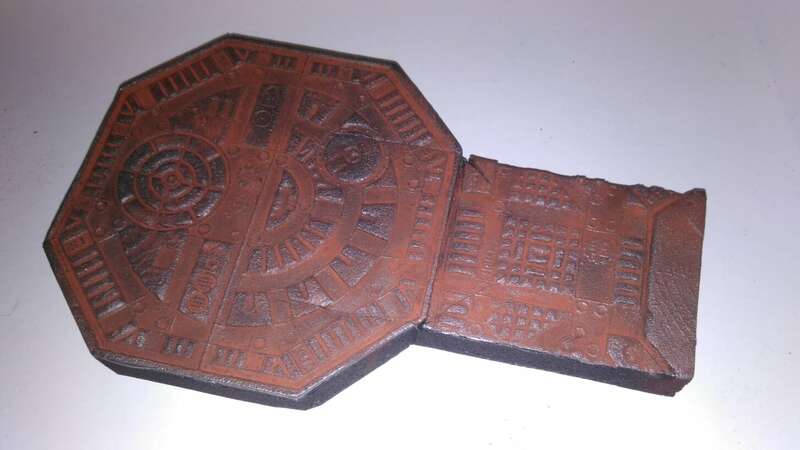 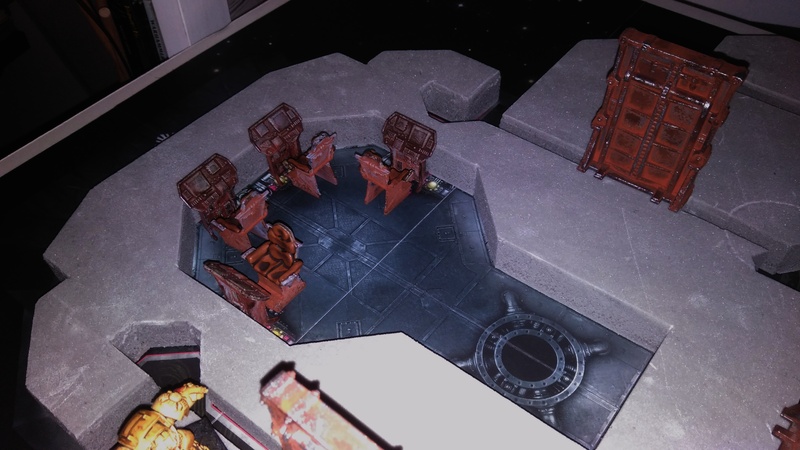 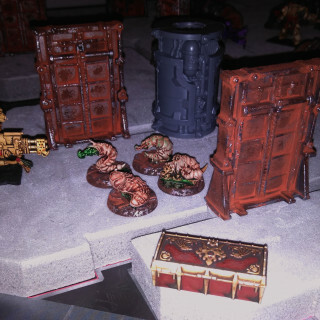 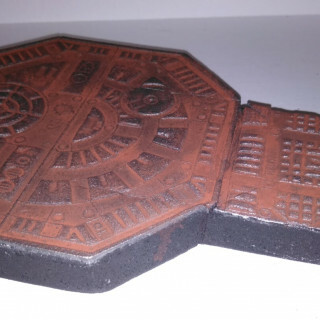 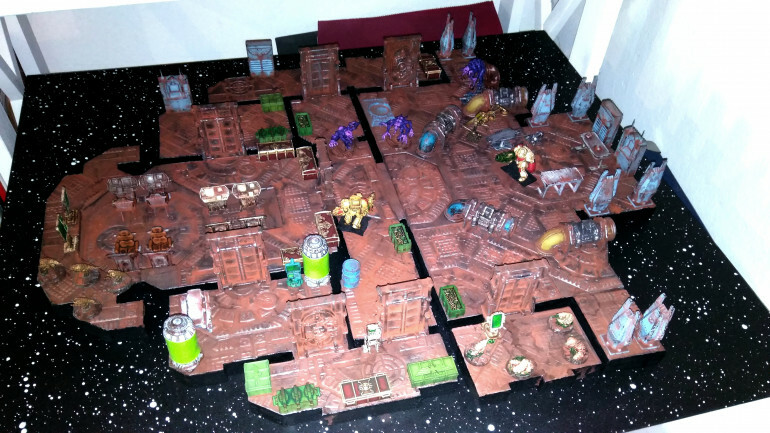 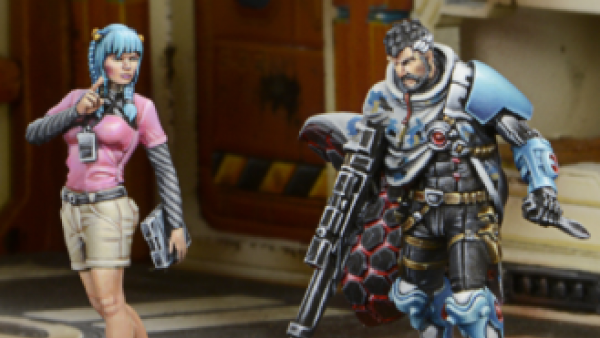 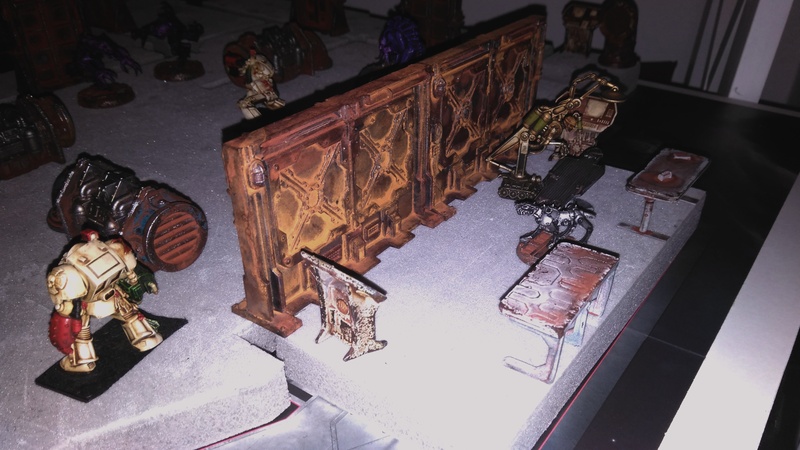 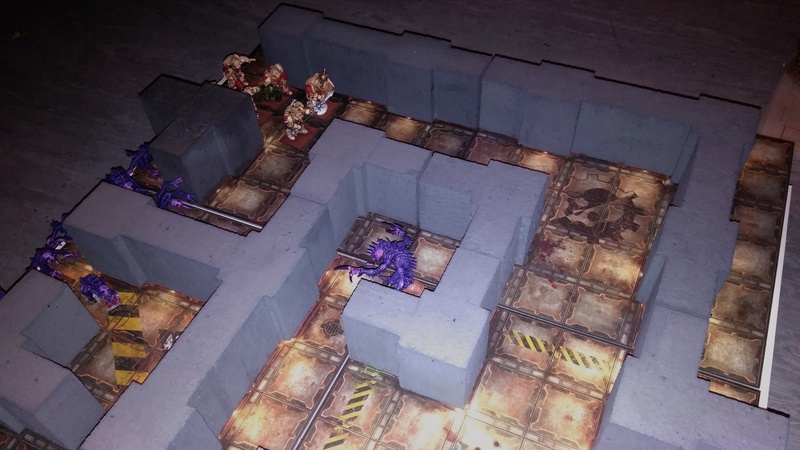 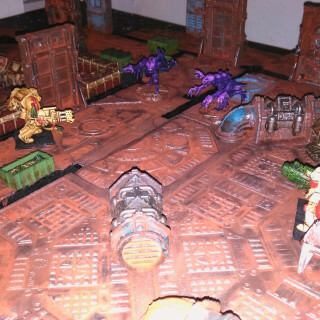 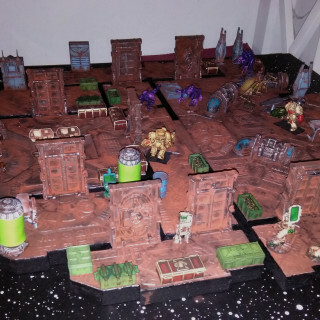 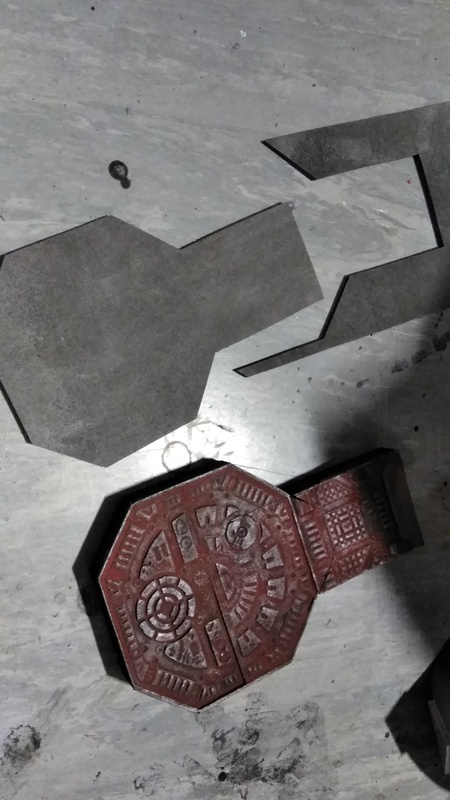 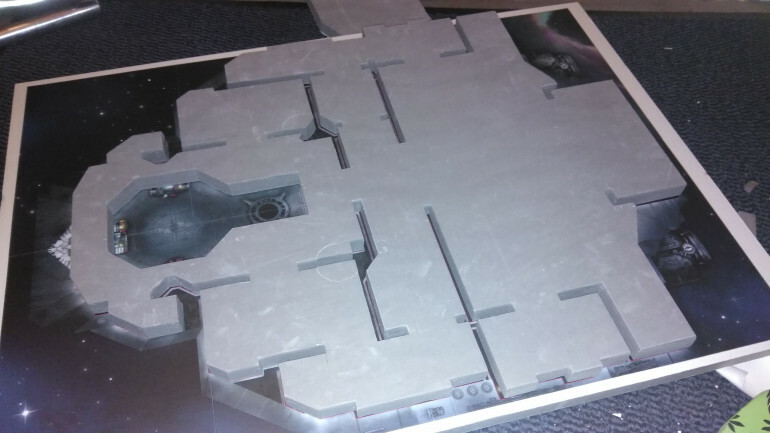 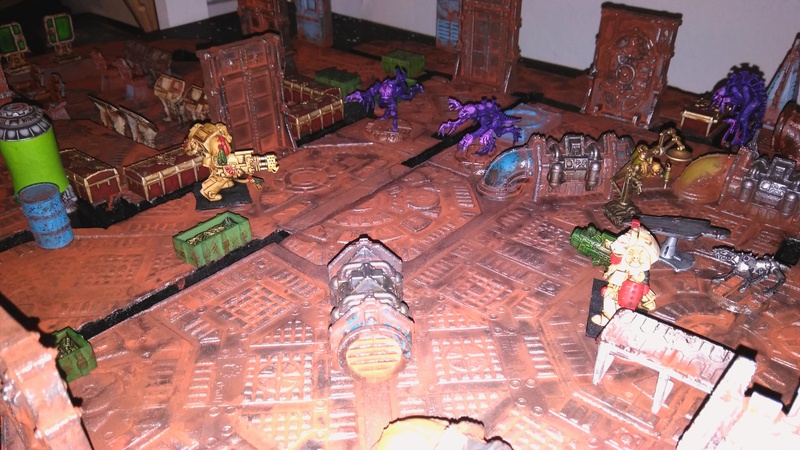 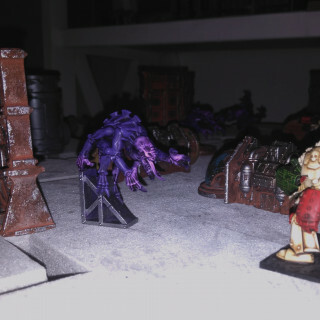 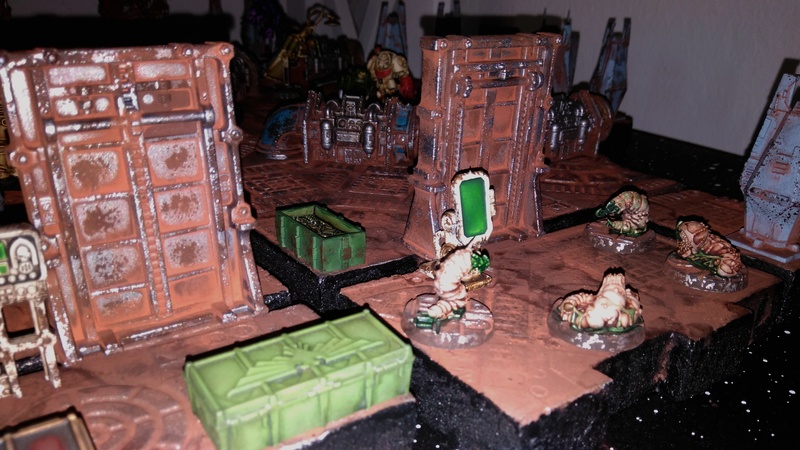 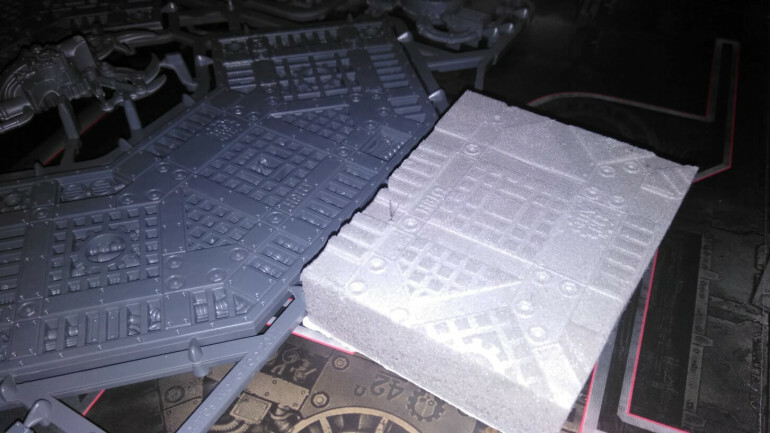 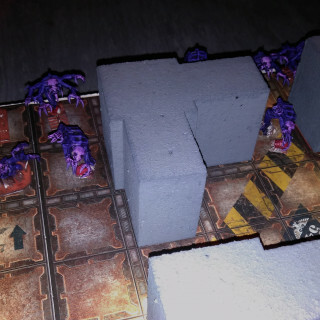 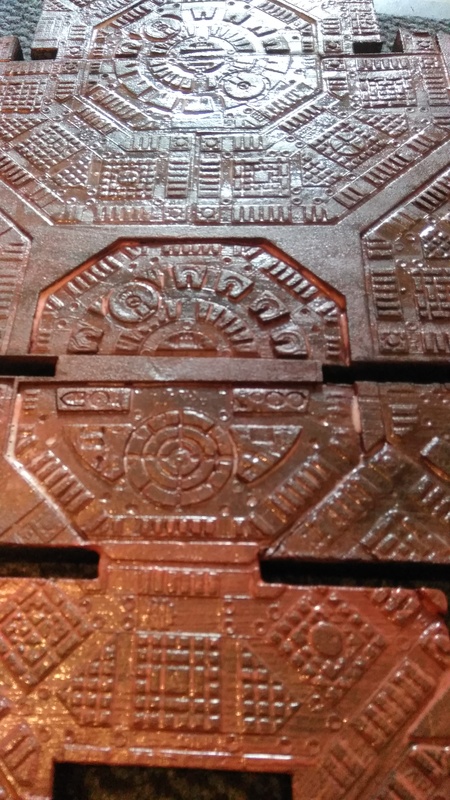 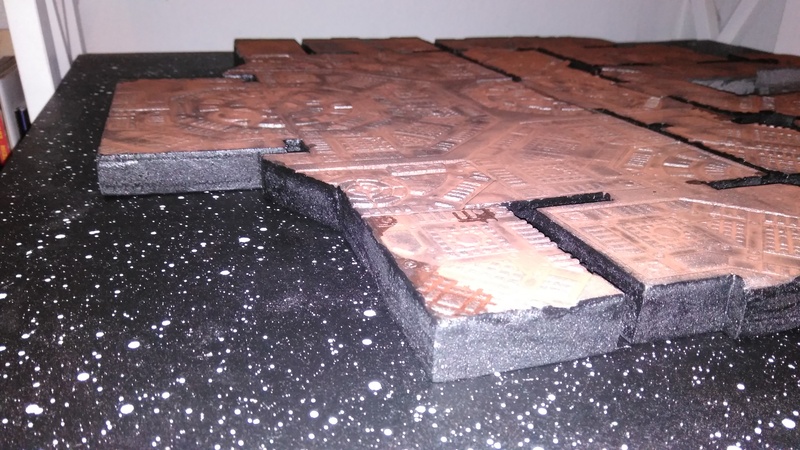 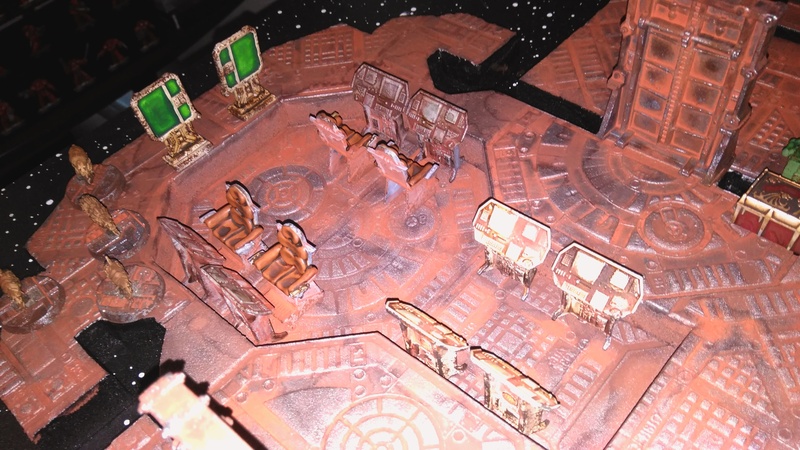 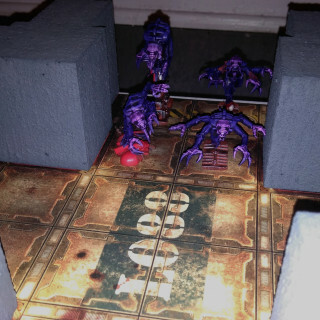 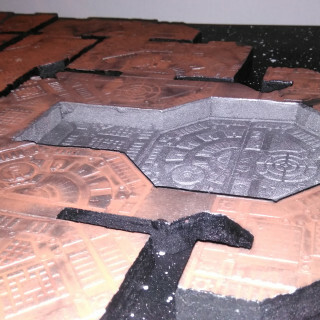 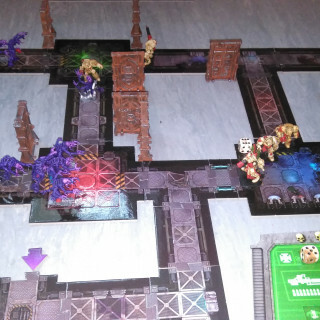 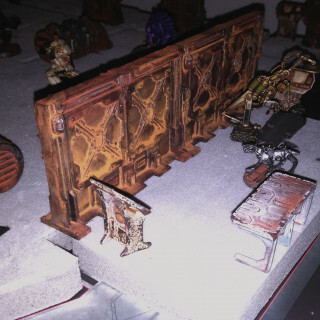 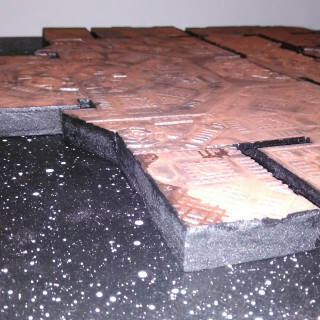 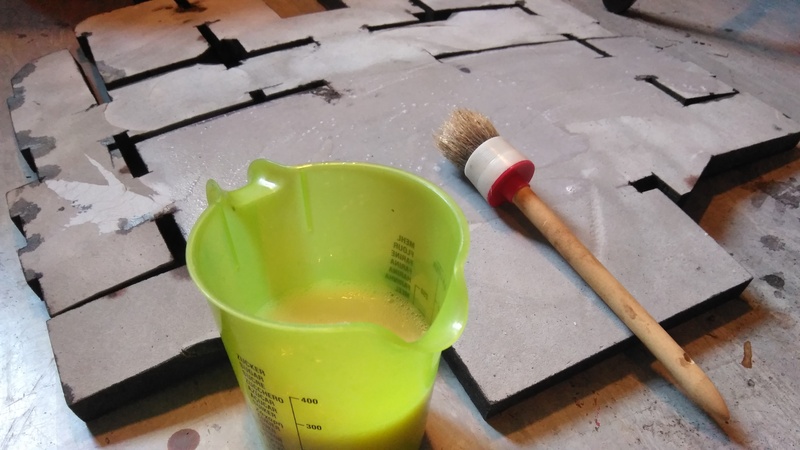 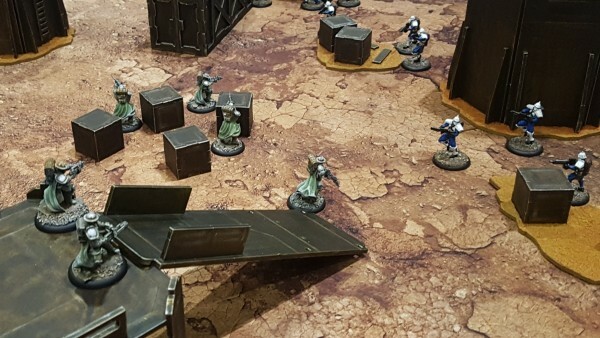 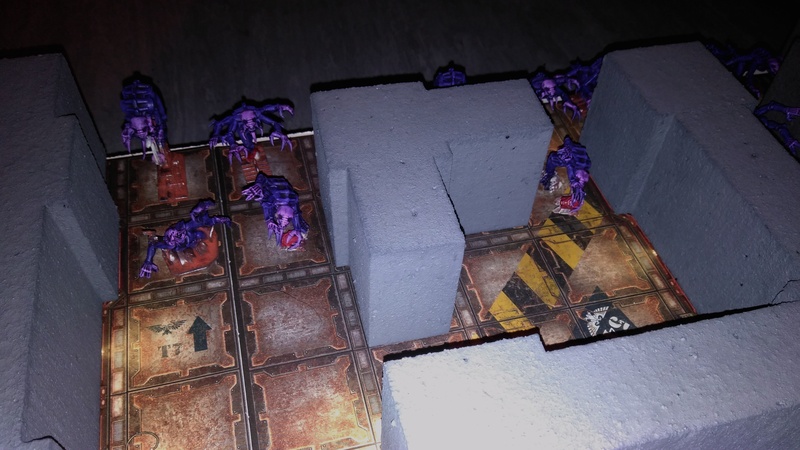 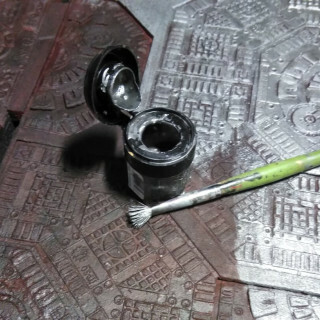 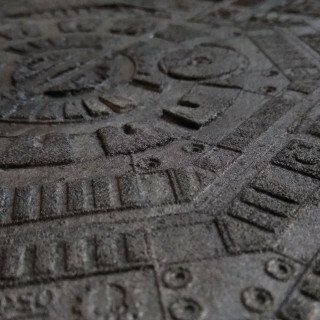 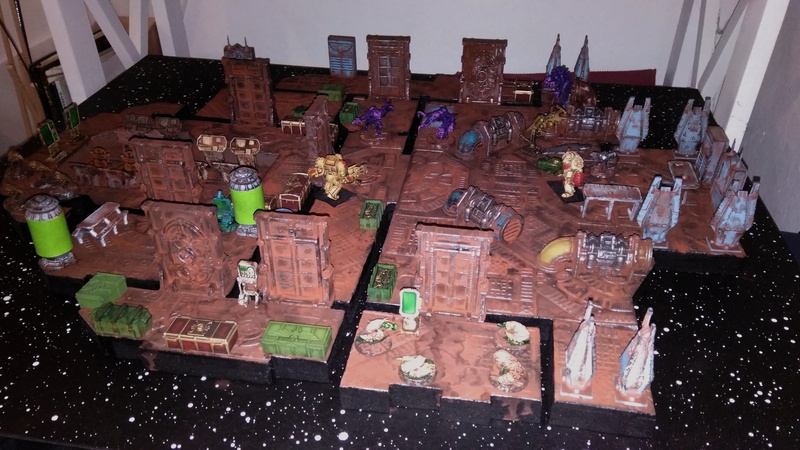 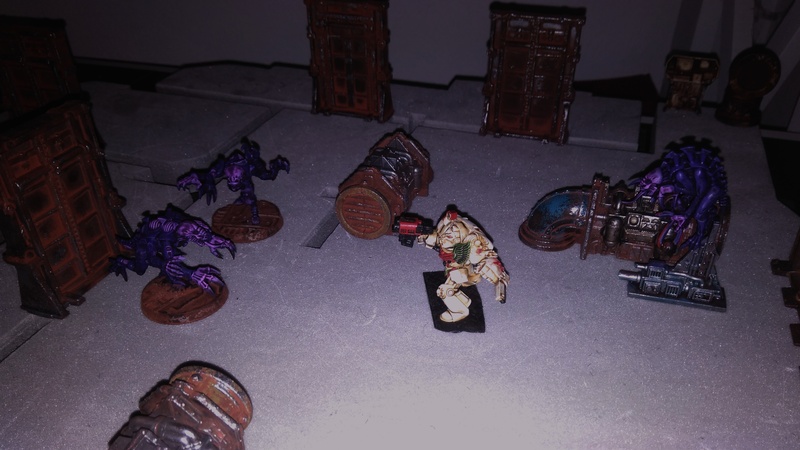 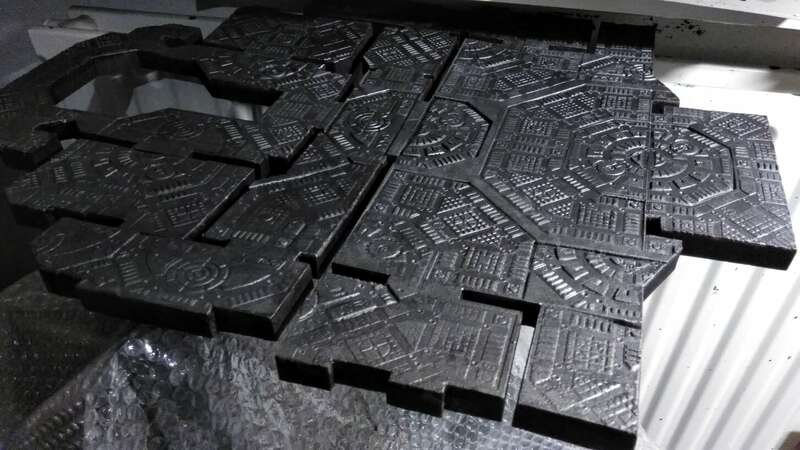 so I was thinking, using the Necromunda Tiles, to play Space Hulk. 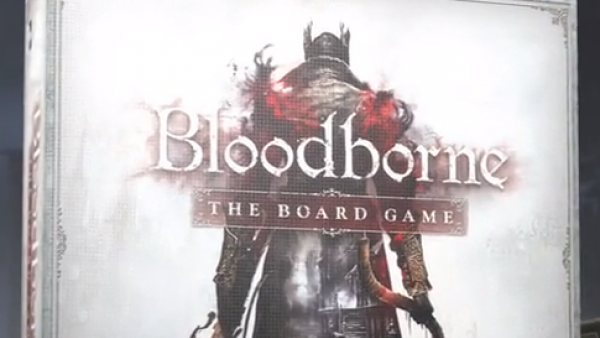 well the board makes it possible to play and move by the Rules, accepted one problem, I hate, more than everything, kill and survive mission. 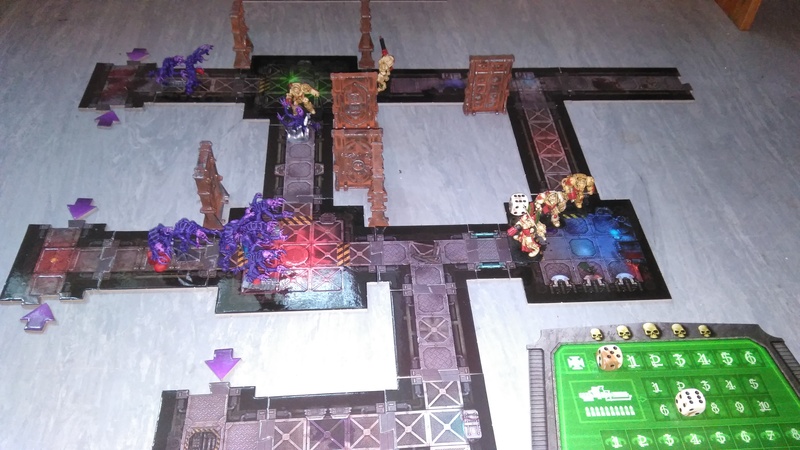 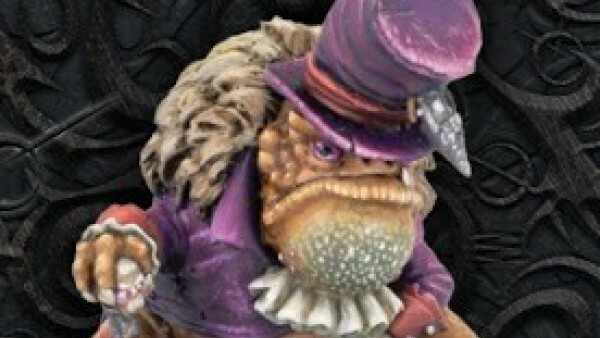 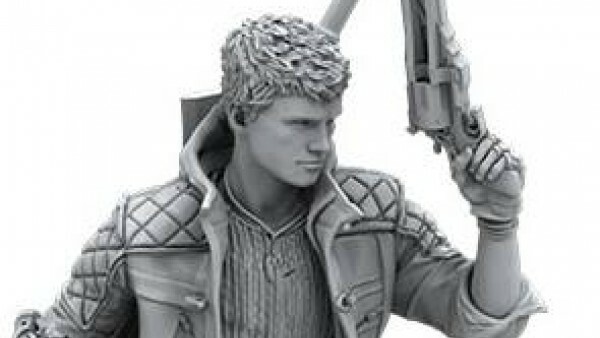 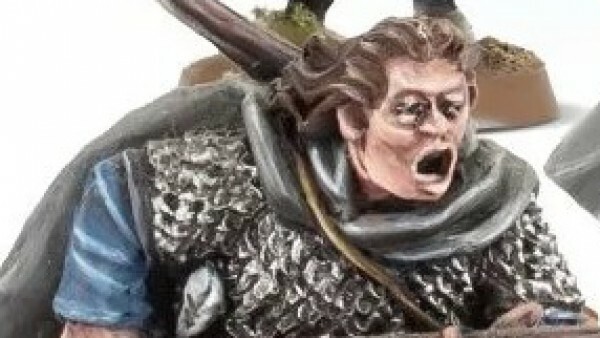 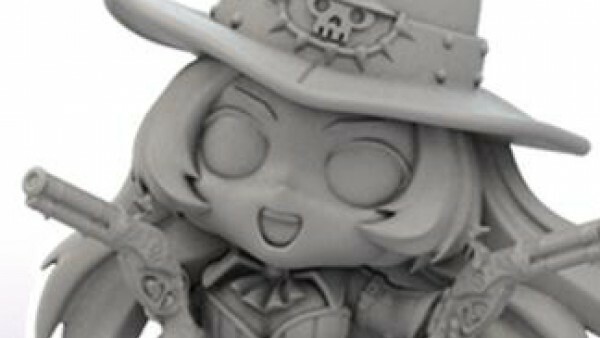 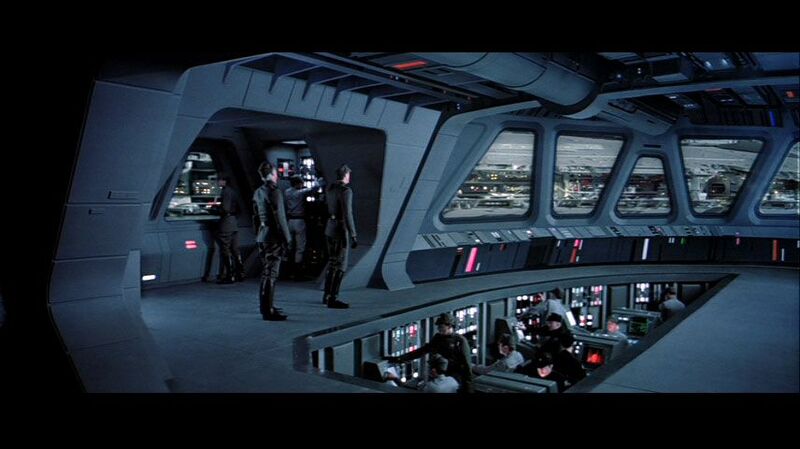 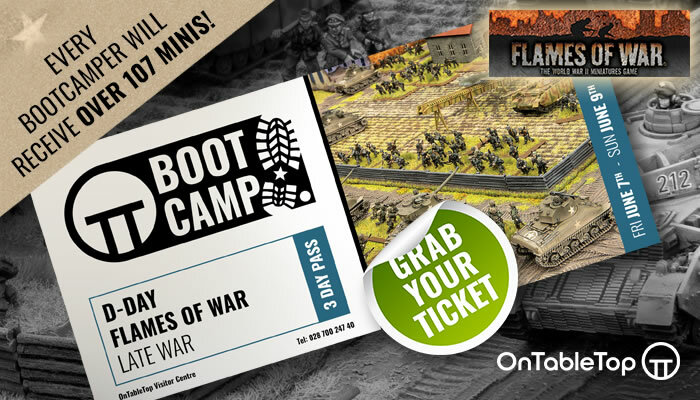 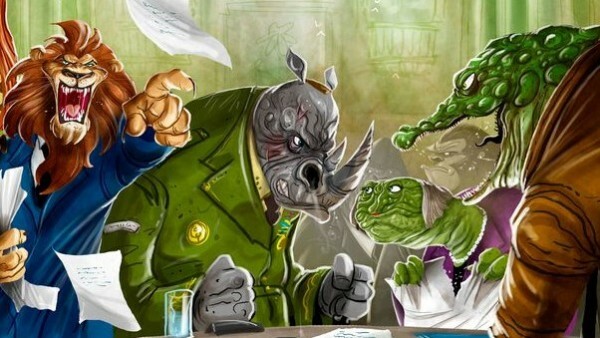 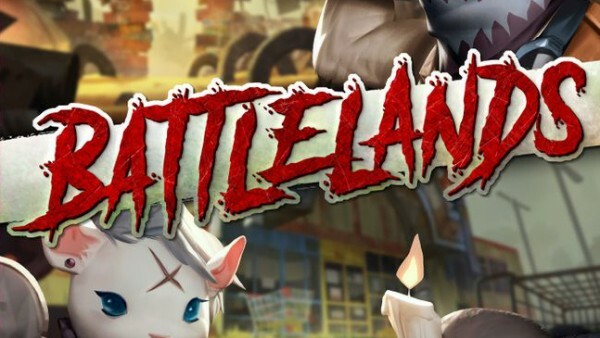 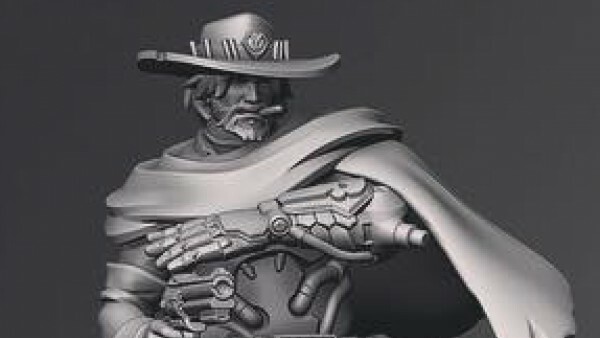 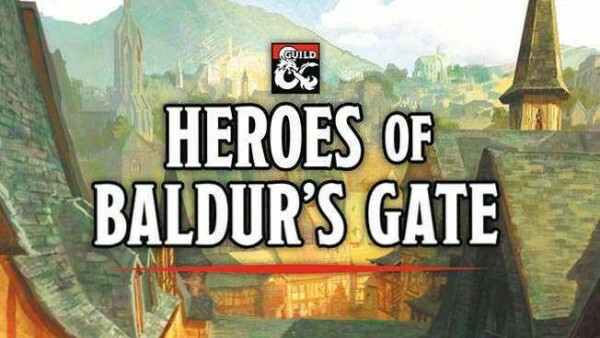 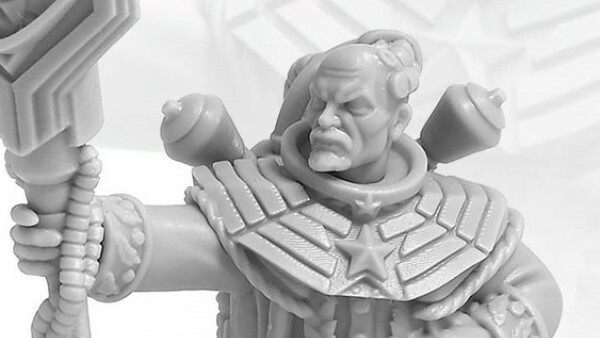 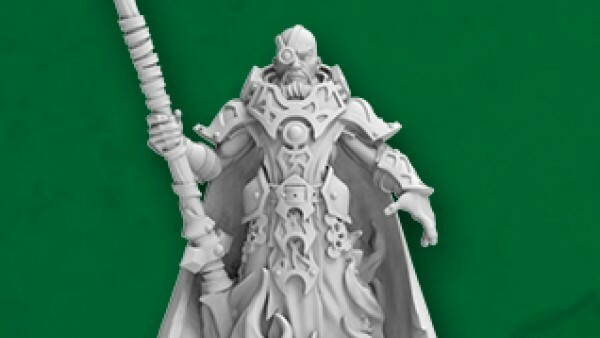 you just stand there with your terminators on overwatch, and whait for the horde to arrive, and then it gets so tedious just rolling the dice and feeding the canon. on the other hand am I so useless in implementing some clever mission objektive that just works on a random map. 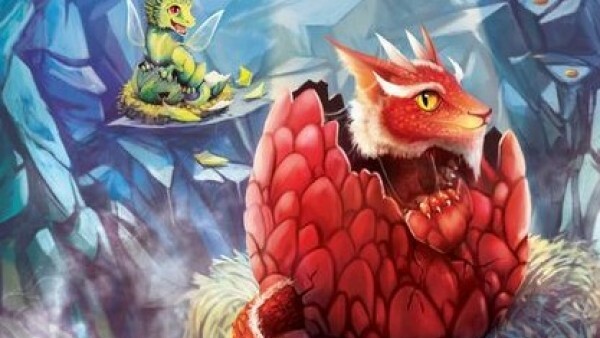 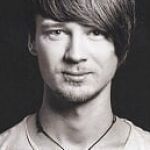 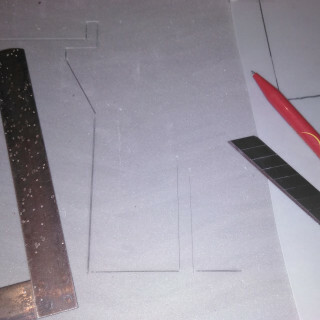 so if anybody have some idea how to implement something, please let me know. 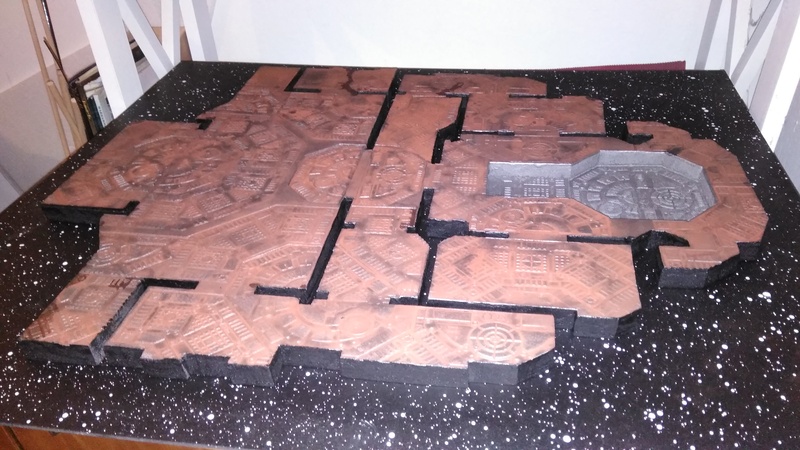 so i thing most of it is done, im still not sure if i add something to the starry background, but for now i just tool all the terrain for it and just had some fun. 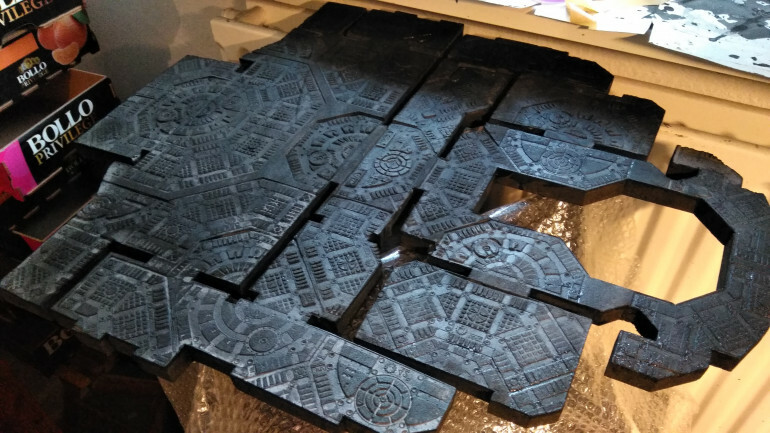 I finally found the time to glue the thing down, with lots of books to keep it straight. 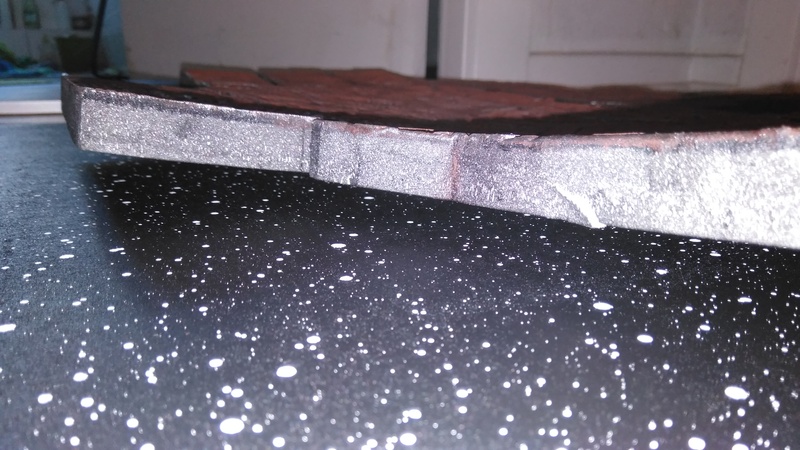 and for now it seems like it will stay that way. 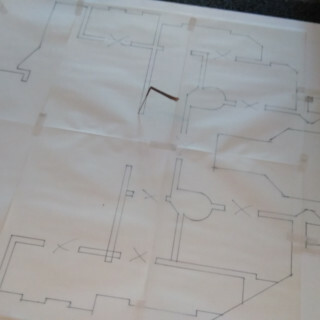 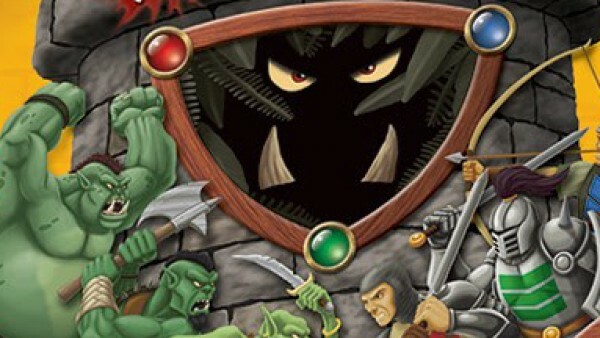 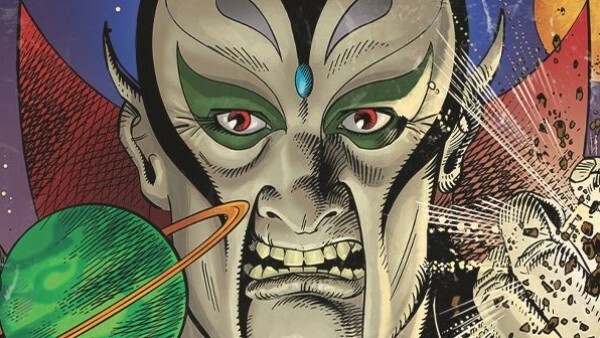 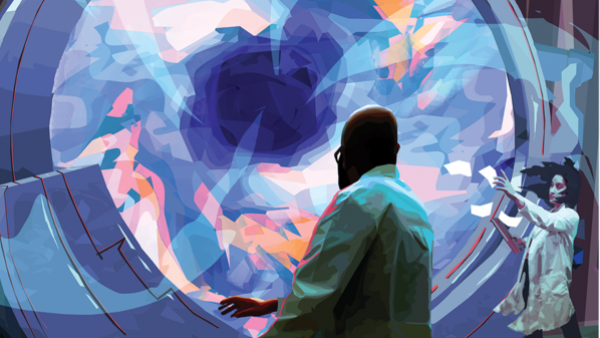 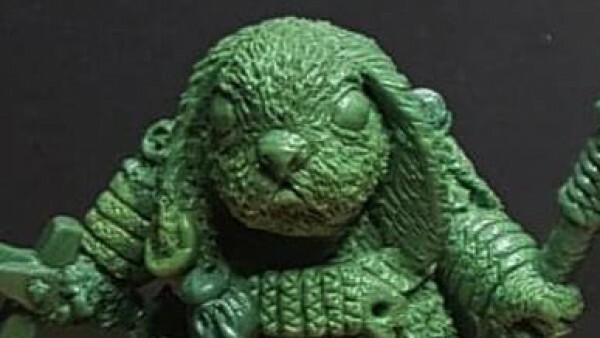 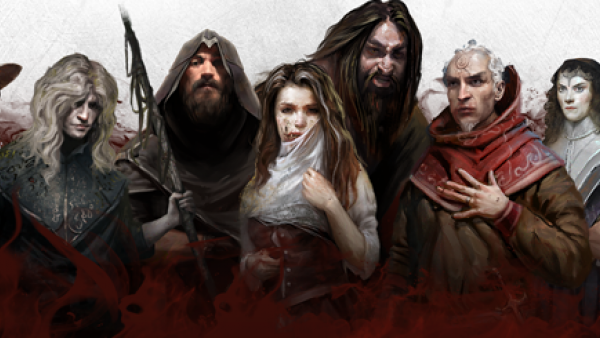 I will covering the missing part hopefully later today, and some retouching here and there. 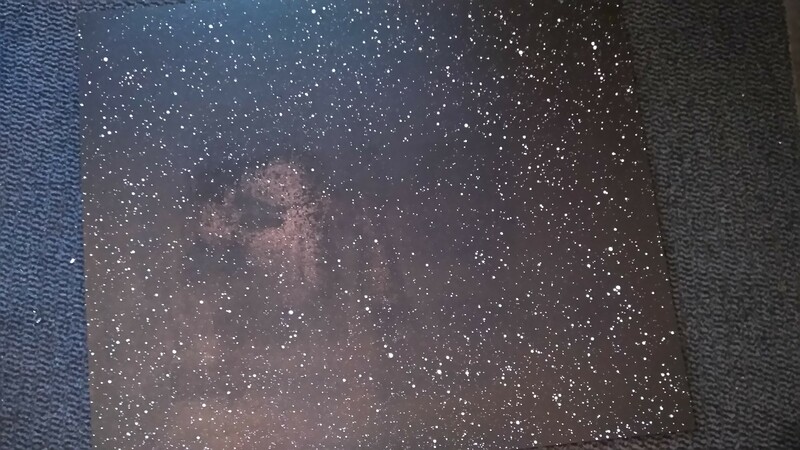 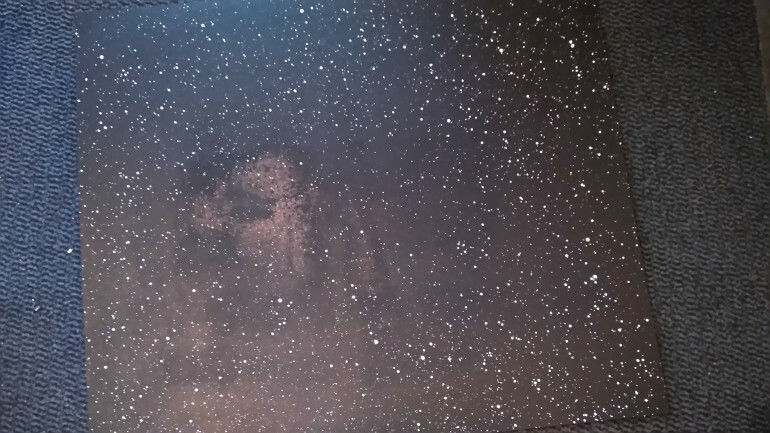 but Im not really happy with the starry background, There are some really cool tutorials on youtube how to do planets and dust clouds so maybe I give that a try. 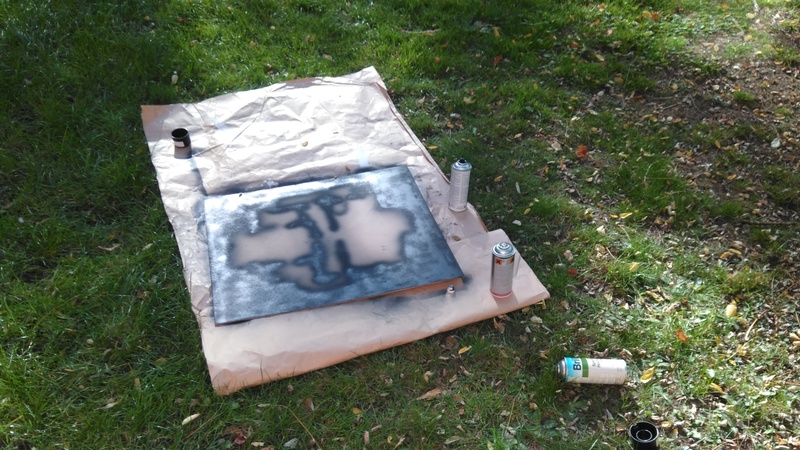 Used the good weather to paint outside, cut me some 3mm MDF and used some old spray paint. 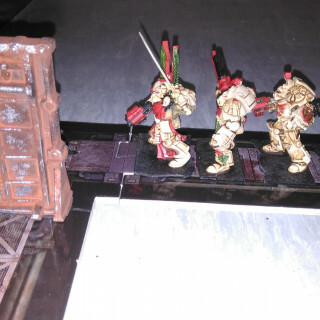 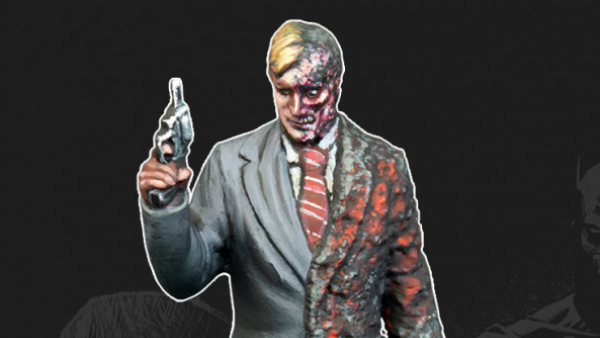 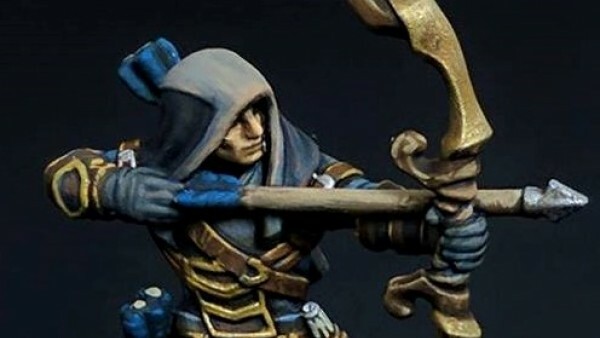 that was a mistake, the paint was to old and came out like a silly string can. 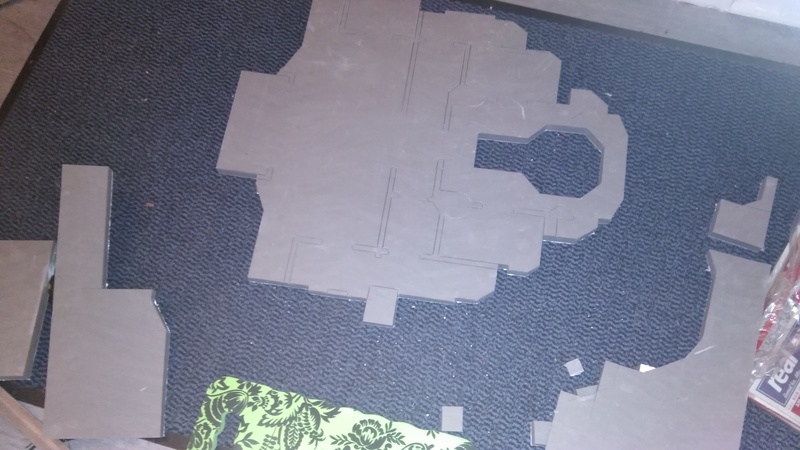 so I’m almost finished, but as you can see the warpige is quite strong and the hardcoad on the back site did not do much. 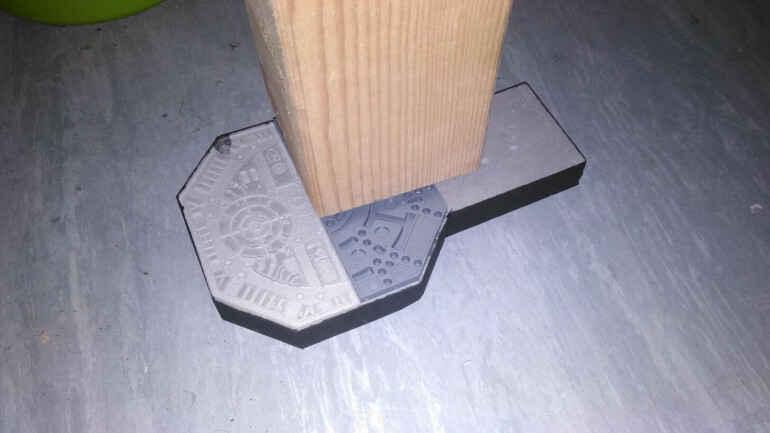 not quite shure what to do. 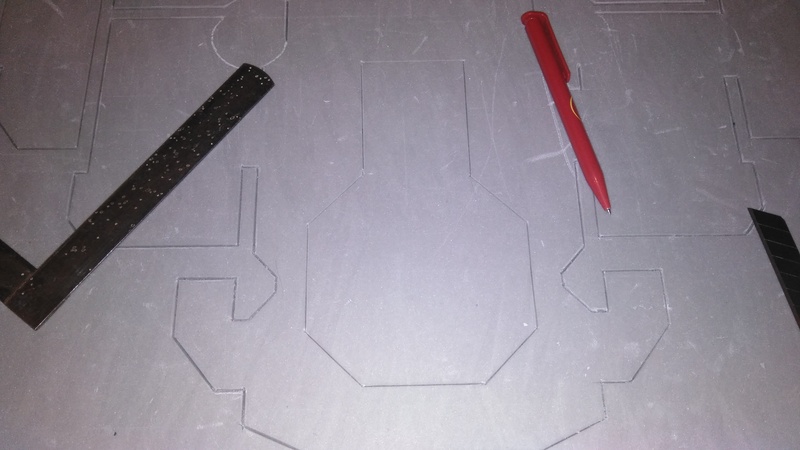 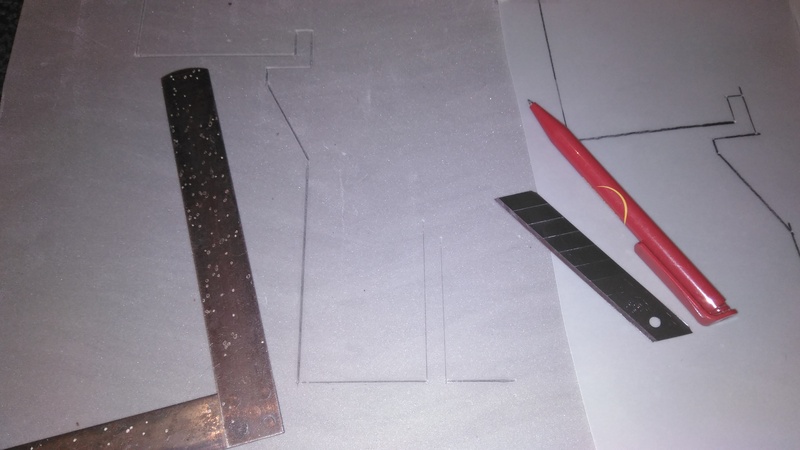 I finally cut out the part for the copit, stamped it and trying to catch it up to the rest of the bord. 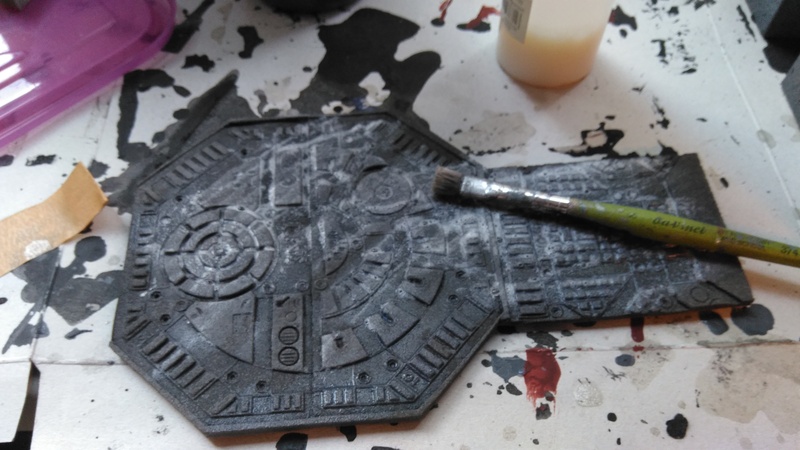 So I spend the evening painting up the final layer. 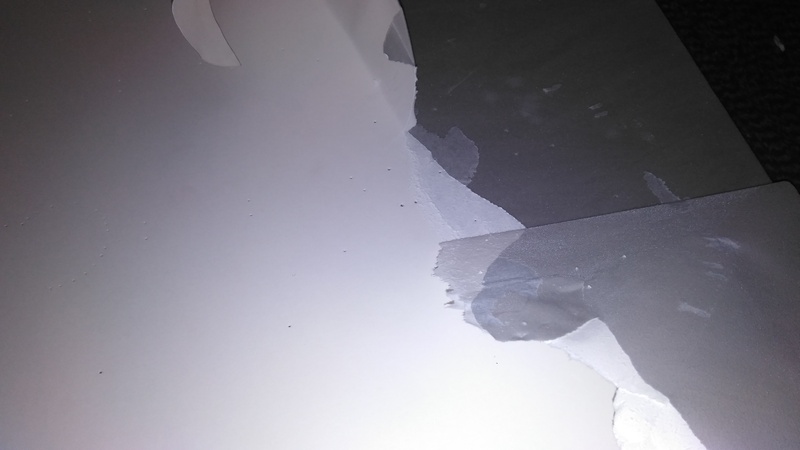 just took a dark silver, thinned it with some water an brushed it on, and there it shows the superiority of good paint, I used not more than let’s say 1/4 of the pot. 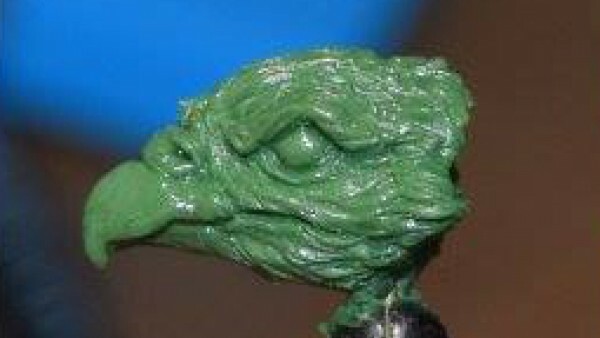 I hope that Ill be able to put down some pigments later in the day, so stay tuned. 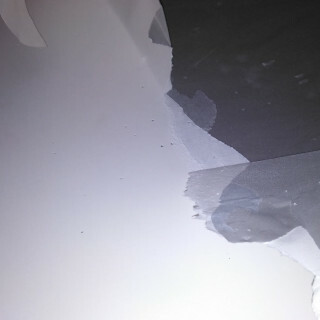 Because the foam is so absorbent, I putting the 3rd code on. 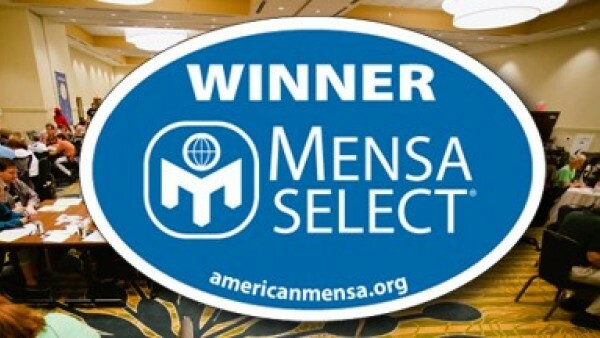 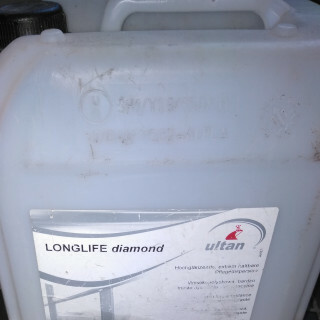 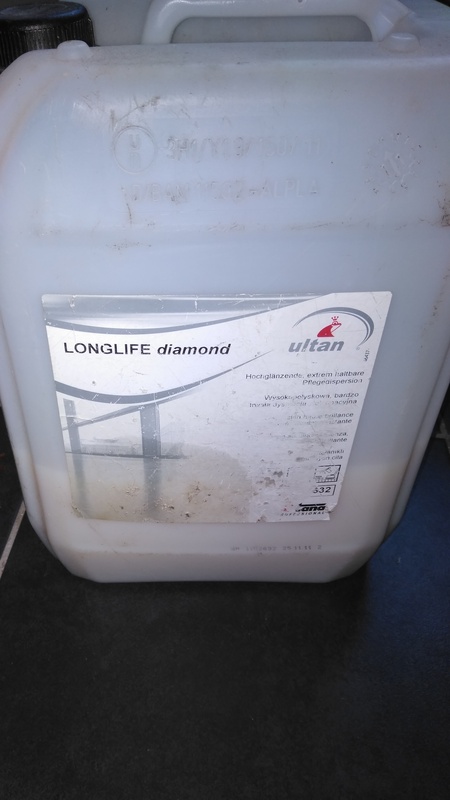 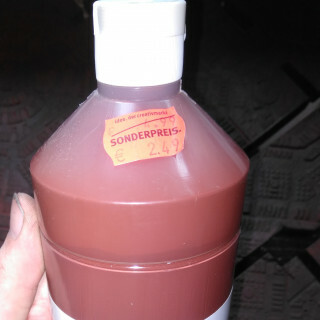 You should always use just the best you can find. 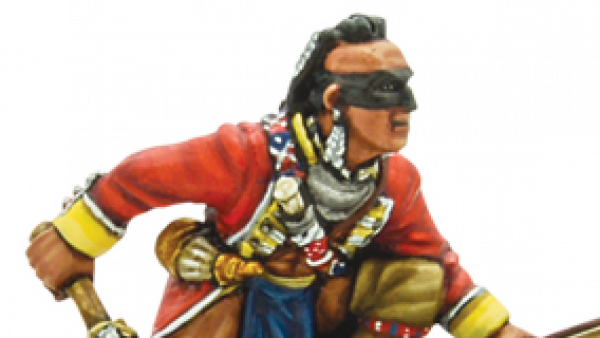 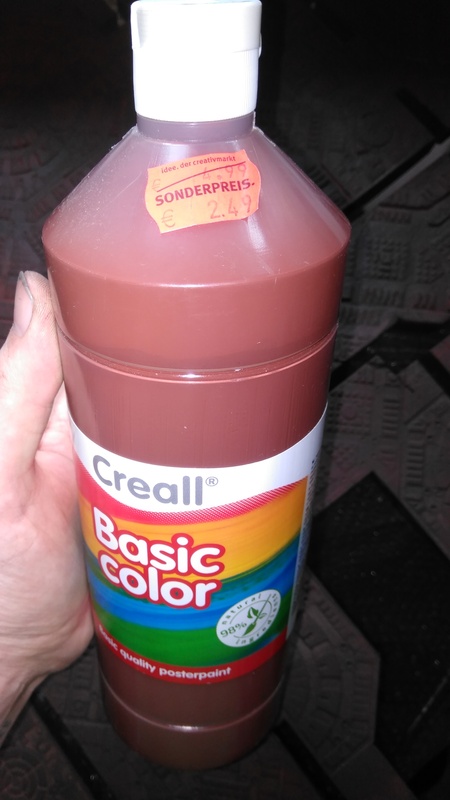 Me for example, I spared no expense using this very "basic color", AKA finger paint, mixed with top of the line PVC floor sealer. 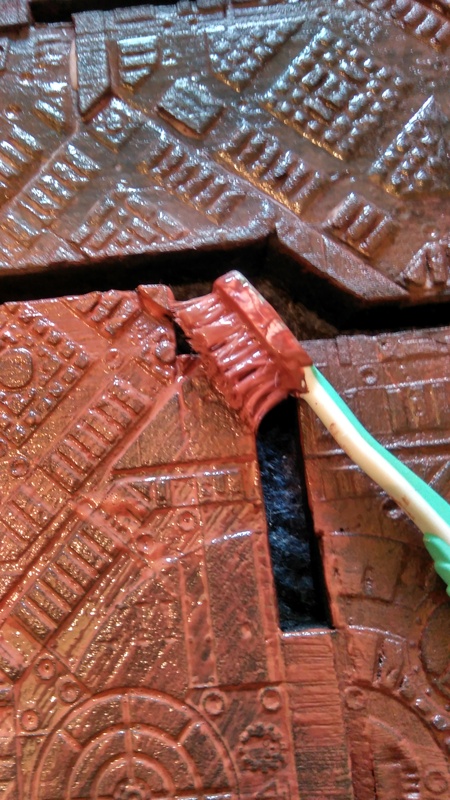 And most important never be cheap with brushes, only the best is good enough, see here my old toothbrush, doing an excellent job ! 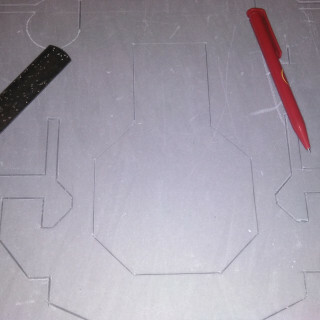 So I took some time and a hammer to beat the pattern into the fome. 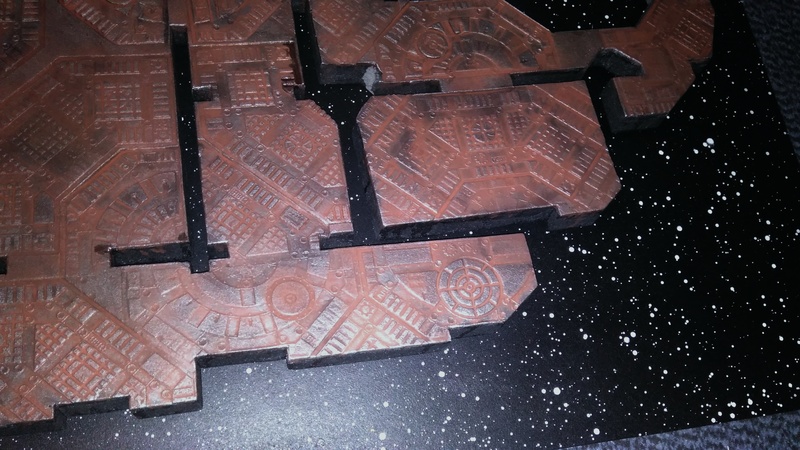 got the second coat of a mixture of paint and gloss varnish. 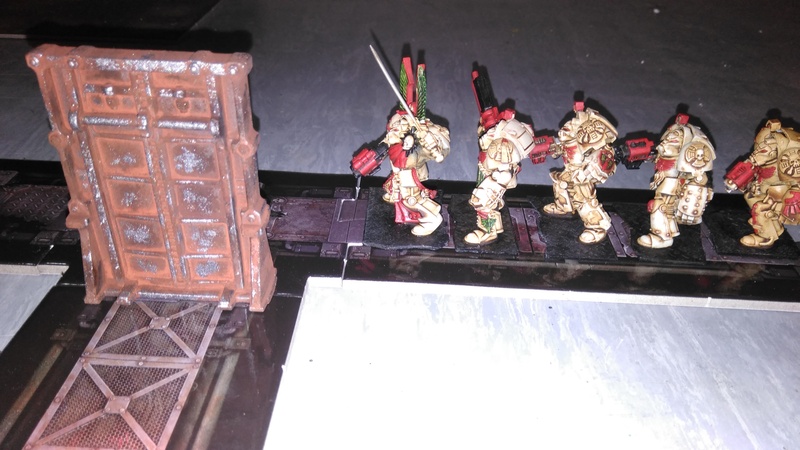 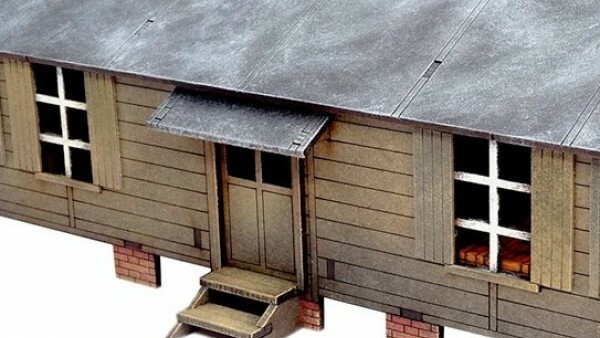 Just took the scenery and lay it out with some minis, had a little fun.